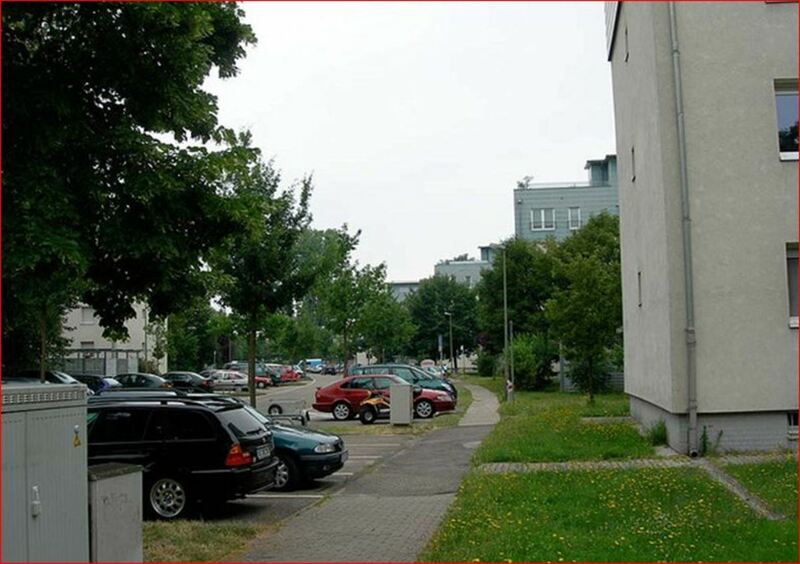 Paul Revere Village And US Army Military Base In Karlsruhe, Germany. 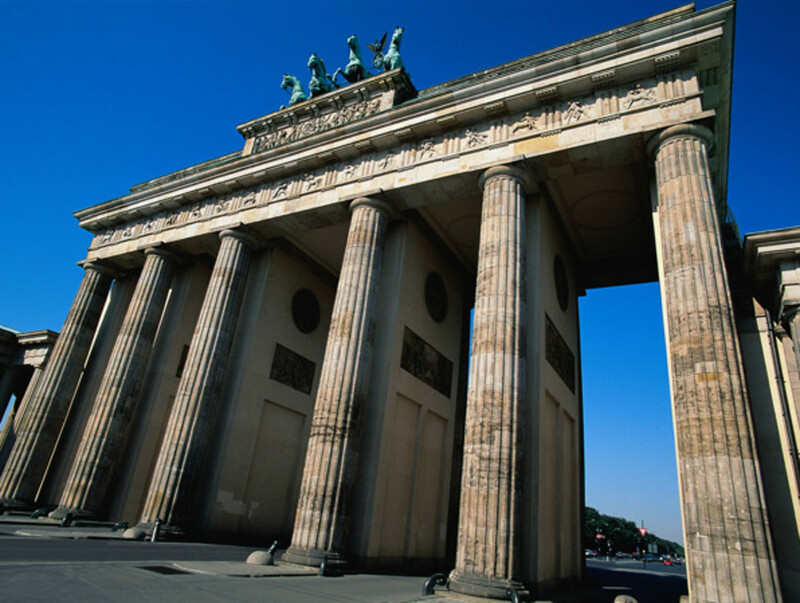 Brandenburg Gate was closed when the Wall went up. Our Days On A Military Base. ONCE A BRAT ALWAYS A BRAT. I am a military brat. 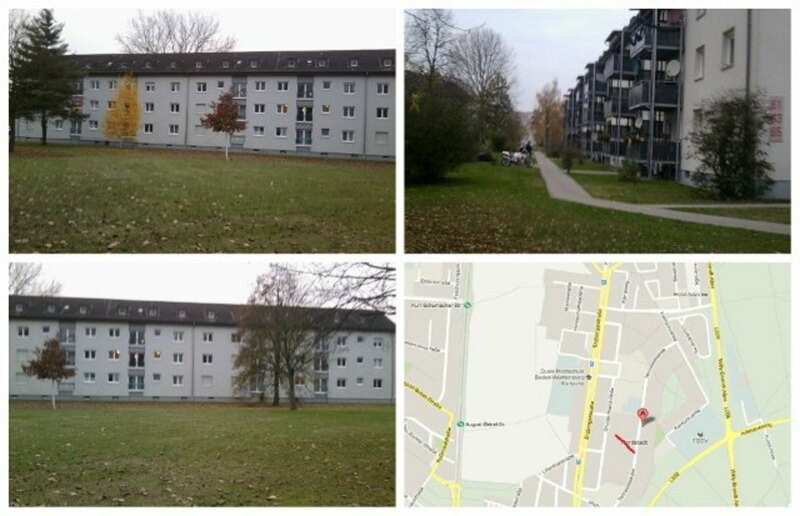 We lived in many different places but Karlsruhe was my favorite place. I loved Karlsruhe lived there when I was a teen. Germany has very pretty cities with many castles. 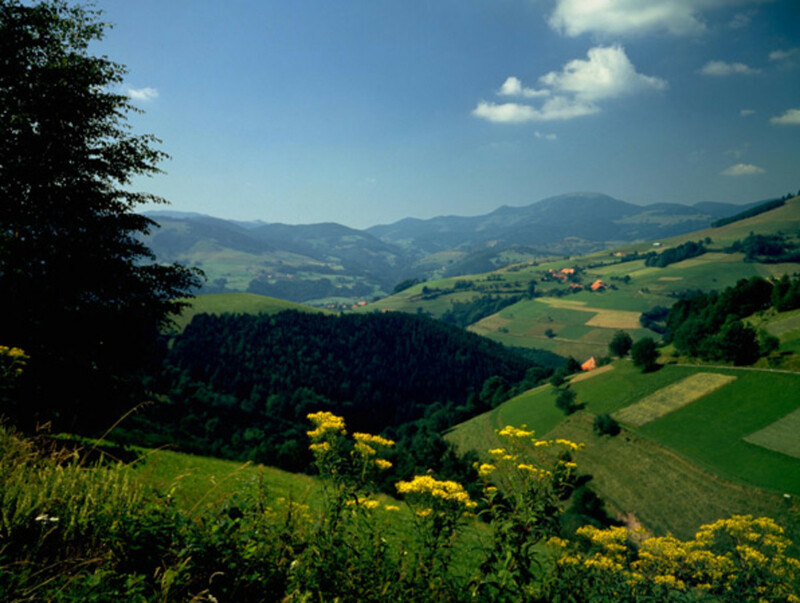 The Black Forest in Germany is beautiful and worth visiting. I have not been back but would someday love to return and visit Paul Revere Village again. It doesn't belong to the military now, but it is still called by its old name. We stayed at Fort Hamilton in Brooklyn before getting on our ship. 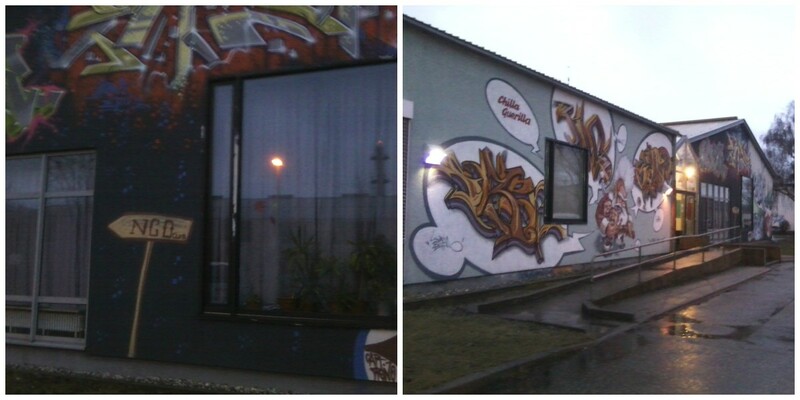 We also stayed there when we came back from Germany. All military families stayed there at the time. We entered Germany at Bremerhaven and then took the train to Karlsruhe. The ship shown in the picture below is the Patch we went to Germany on it. We came back on the Darby. The ships were fun to be on. I never got seasick, but many did. From the ship, we took Germany's fast train. We sleep in the sleeper compartments. 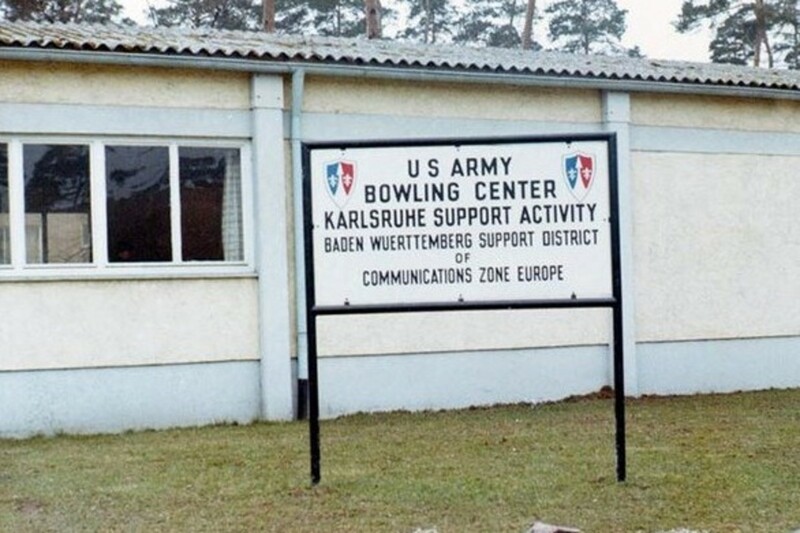 The military had a base in Karlsruhe. We were sent there to be with my Dad who was in the Army. We lived on Paul Revere Village on the military bases. We were on the third floor of our building. I could look out my bedroom window and see the baseball field and the school. My Mom never knew we often took the screen off and hung out the window yelling to kids we knew walking by on the sidewalk below. We were there when the Berlin Wall went up in August 1961. It was scary, family back in the states wanted us to return to the states. There was a talk of war at the time. We stayed and things calmed down. The military base had a bowling alley, snack bar, and PX, Commissary and movie theater. We were kids; we ran all over the base and went just about anywhere we could go. We went off base to get our hair done and to buy bird food for our parakeet and often took a taxi downtown to shop. The taxi ride was cheap. If my mother knew some of the things I did she would have a fit. She's 90 and I still haven't told her about the places we went. She often thought I was staying at a friend's house, safe and sound with the parents there. We walked off the base in the middle of the night, past the French compound. No one ever walked past the French compound, we were told, but we did. We would go to my friend's house she lived off base and we would have to climb up on her balcony to get in the house, she never had her key. Her parents were never home. All we did was have a slumber party we never had boys over. Her parents would eventually get home and poke their heads in the door to say good night to us. Please be sure to check the 2012 pictures of Paul Revere below. November 11 was the start of Faching and goes on for three months. What a party it was. We would go into town and join in the fun. Germans love to dance and have fun. I know we weren't supposed to be there. We hung out in bars downtown. I never did drink, no kidding. I always got a coke and a shot and gave my shot to someone else. On the weekend, you could only buy liquor in the bars. They were coffee houses during the week. We went into a restaurant off limits, like any teens breaking the rules. We sure knew better and what trouble we could have gotten our Dads into because we were breaking the rules. We once went all the way to Frankfurt just to go skating. Without Mom and Dad's permission. While there we saw Priscilla Presley. She was standing across the rink from me and someone pointed her out. Just a cute little teenage girl at the time. 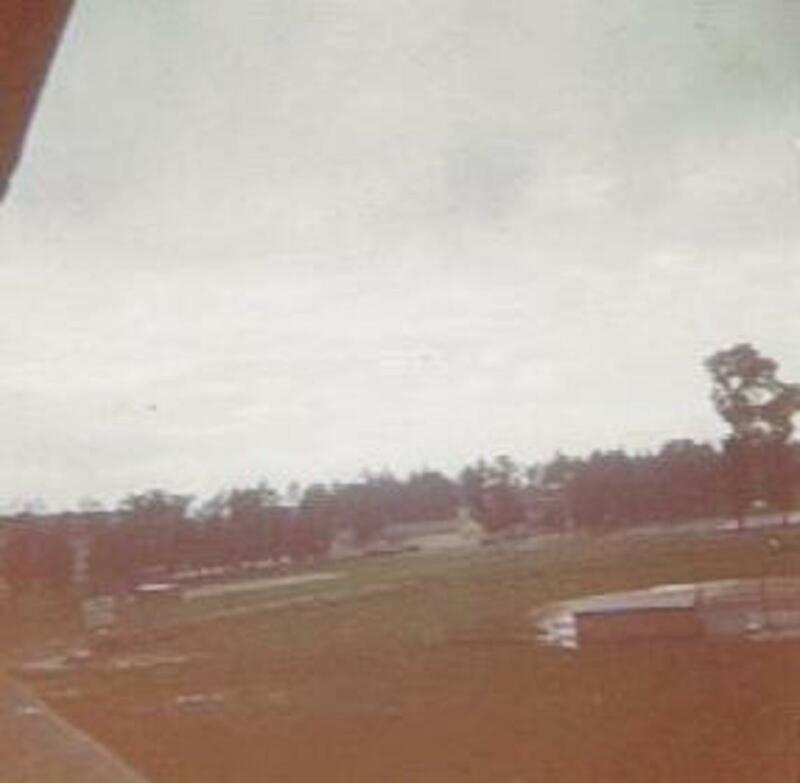 Baseball field with Teen Club in the back ground. By our building lady with baby and white poodle. Tennessee Strasse out my bedroom window. My sister Joyce and me. Kathy Picorozzi, Pete Blackburn, Mary Poole,and me in front.Of Mary's Building. Kathy Schoen with our cat. Toni Wolfe, Mac, Me, and Bob. 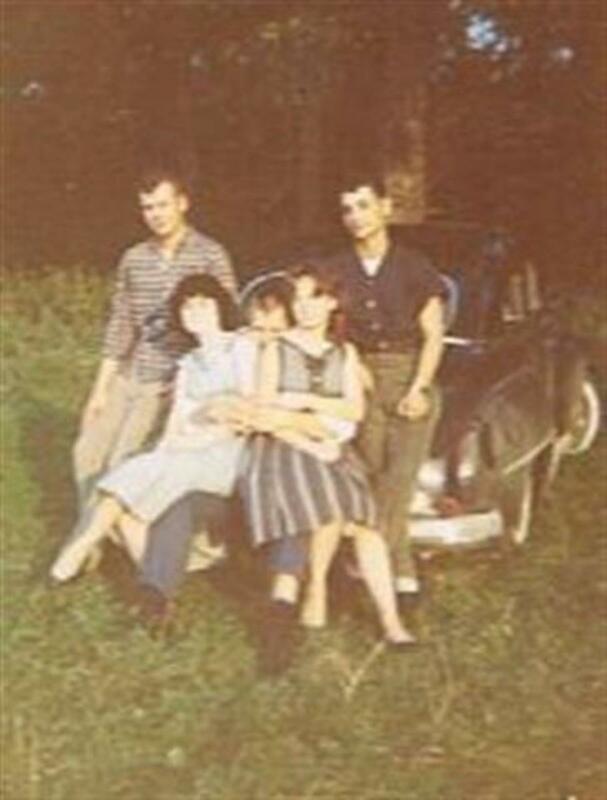 Tommy, Joyce, Jackie and Glenn. 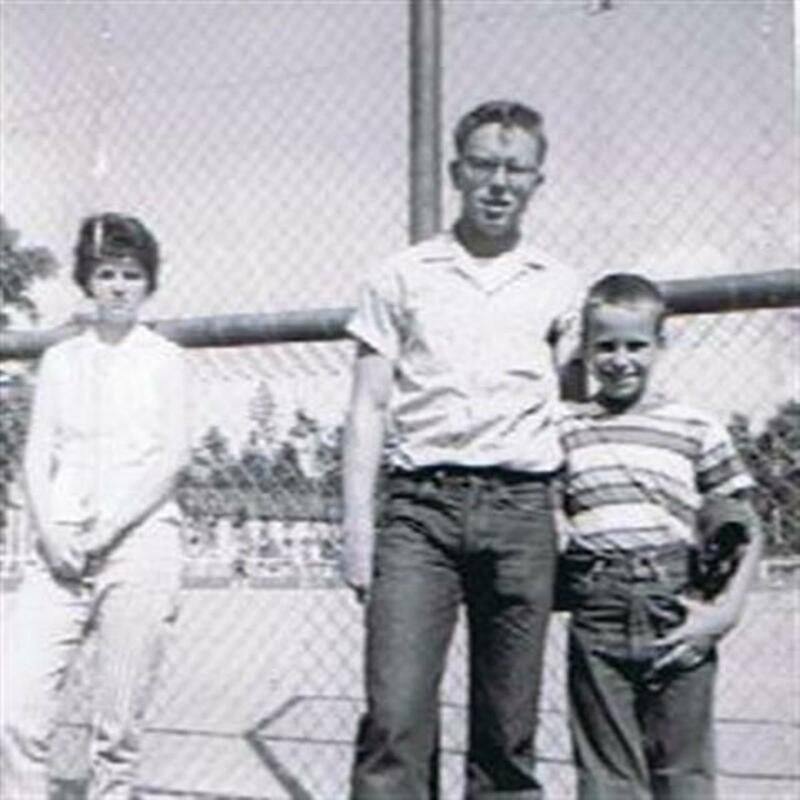 Mary Poole, Steve Haverstick and I don't know who the little boy is. Our last day in Karlsruhe. Left Germany and went home on the Darby. 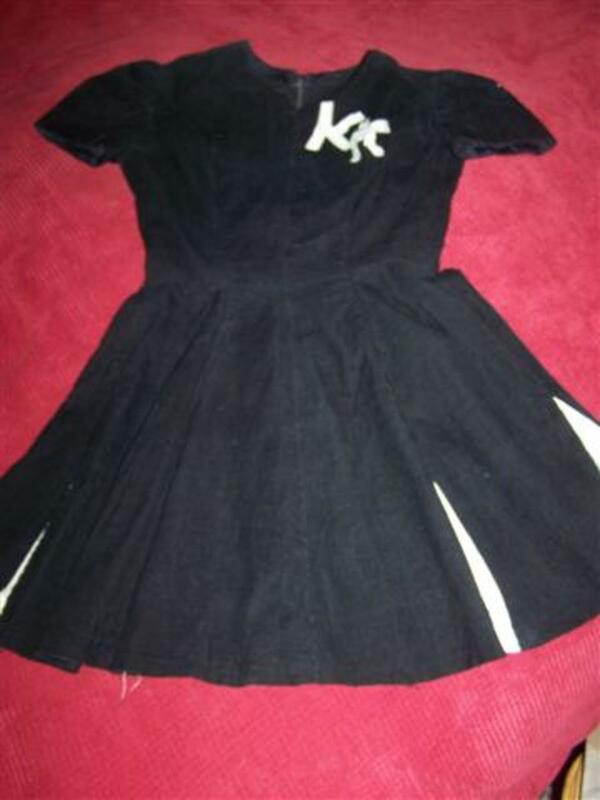 My drill team outfit, still have it fits on my leg and that's about all. Our apartment was the third floor at the end. 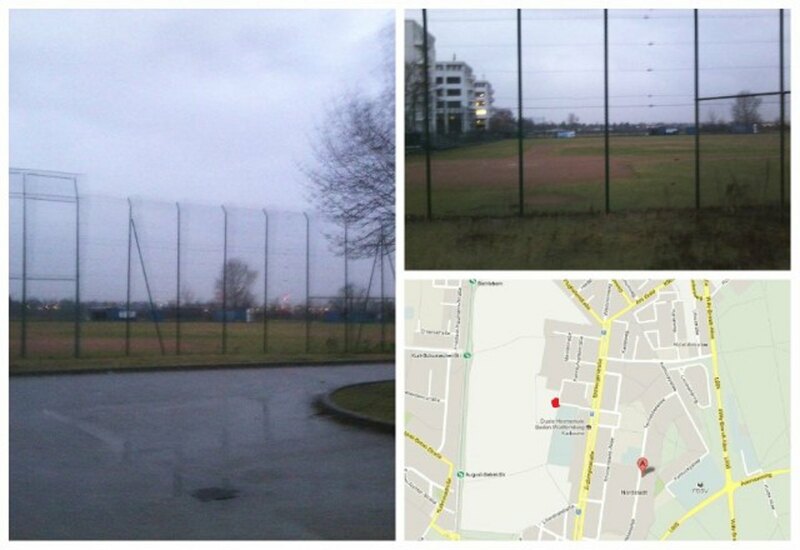 The red star was my bedroom window looked out over the baseball fuild and I could see the playground and school. My baby sister and brothers in stairwell. My baby sister in Karlsruhe. My brother and sisters and one of their friends. 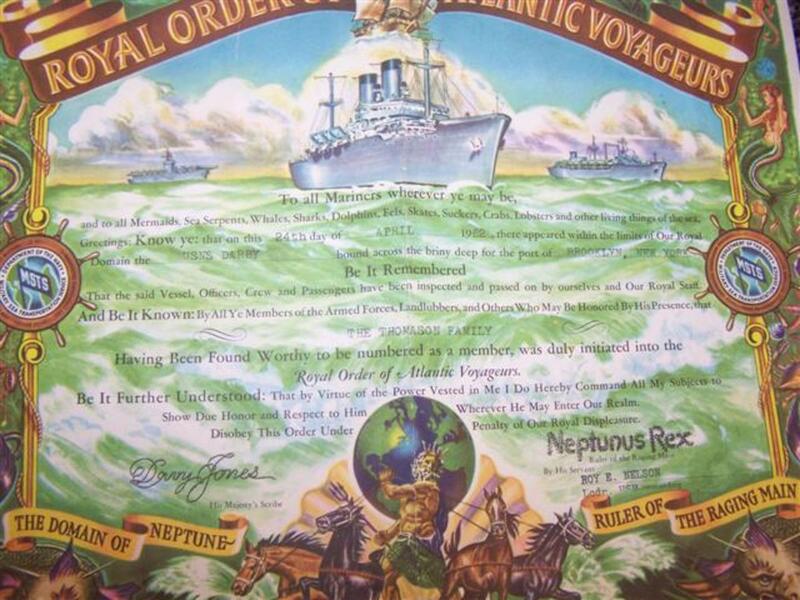 Ships like the Patch and Darby, ships of the globe-circling fleet of Navy and commercial ships operated under the Military Sea Transportation Service. This Navy agency provides ocean shipping for the United States armed forces and other authorized agencies. We went Germany on the Patch and came home on the Darby. There was the main village than all in around us were other barracks. One of those barracks had the swimming pool where we would spend most of our summer. Ride the bus there and come home when it closed. 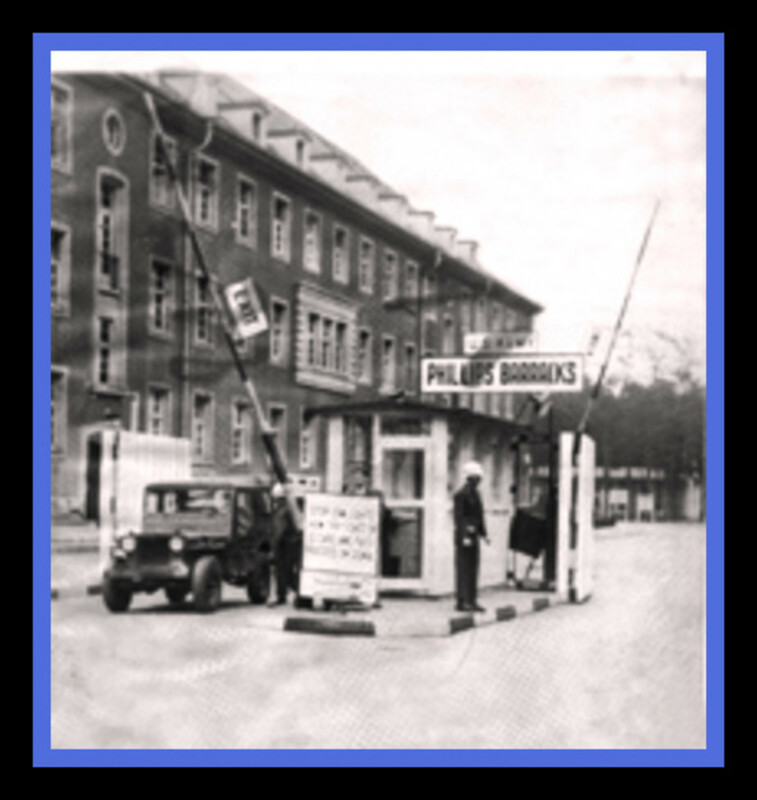 There was Smiley Barracks, Rheinland Barracks, Neureut Barracks, Phillips Barracks, and Germersheim Barracks. We also spent many days at the bowling alley, teen club and the snack bar. Snack bar was where my friends and I hung out the most. 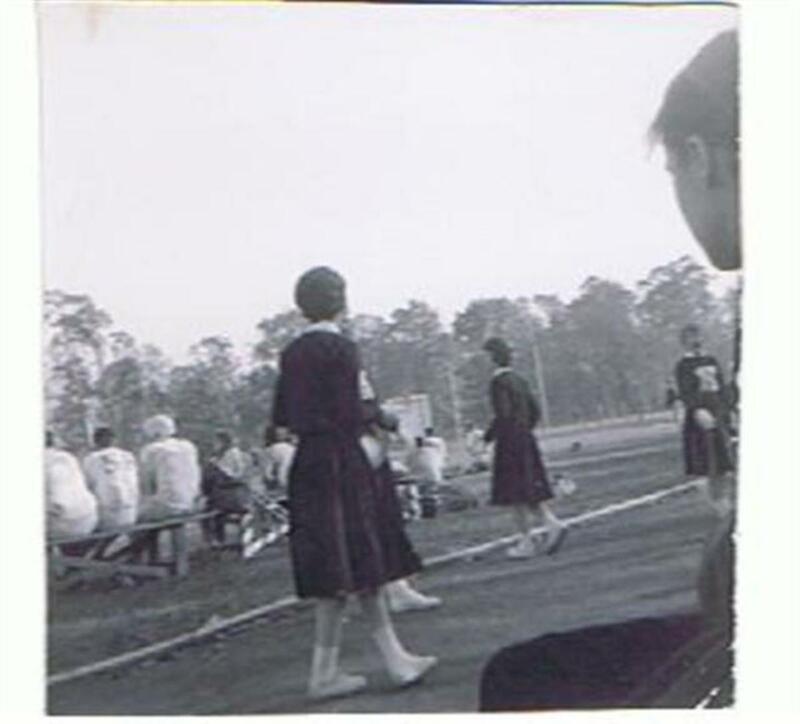 I remember going to Smiley Barracks with the drill team and marching on the football fields sometimes in mud. I was also in chorus and we would sing in churches downtown. They were such beautiful churches. We would go there on the bus and never get back on the bus. My friends and I would head out someplace else. They never counted heads or looked for us. I wasn’t in chorus because I could sing I was in the class because I needed it for a credit. Below is the map of the village. Where did you live? Click to enlarge it. 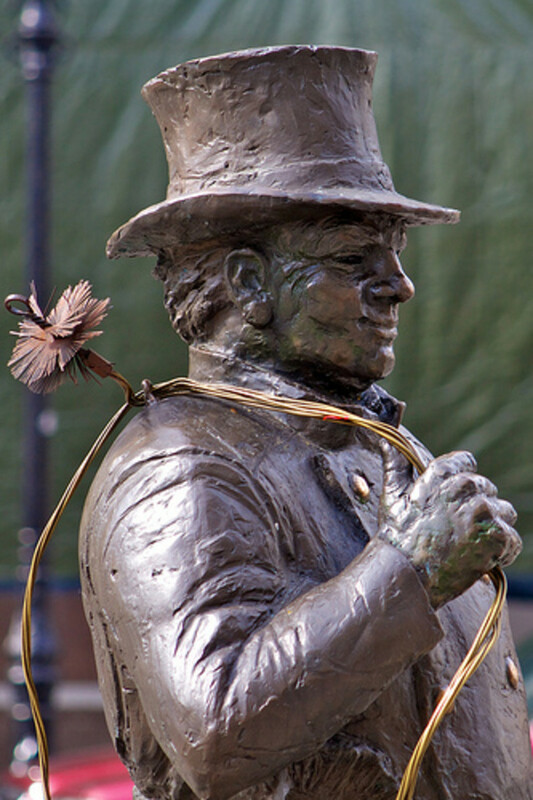 Chimney Sweeps were common to see around town. They always seem to look so strange not something Americans were use to seeing. It was so hard going back home. We had to leave friends, boyfriends and good times behind. You may never see these friends again. We always knew we would never be in one place more than three years. We moved to El Paso, Texas. Daddy was stationed at Ft. Bliss. We lived in Lower Valley of El Paso. The school was a shock to me it was so big so many kids. I had never been in a school this big. I lived in Upper Valley El Paso when I was 13 went to a small school. Then we lived in Arkansas and l went to a small friendly high school. 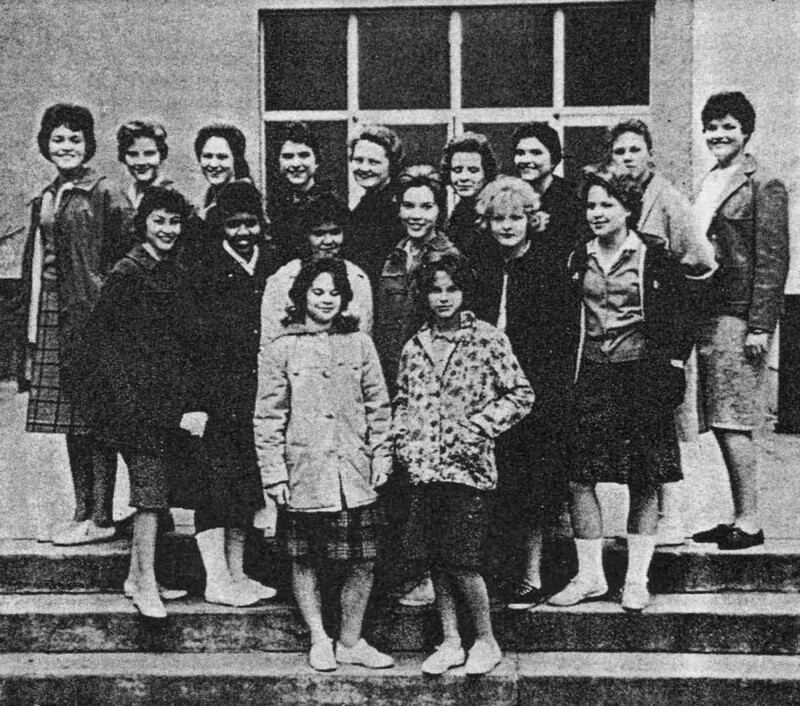 After Arkansas, Karlsruhe was also a small friendly high school. All at once I'm in this large unfriendly high school. I hated it. It was so hard to adjust to the states. As military brats, I'm sure all of us have gone through this. It was always a struggle to fit in no matter what schools we went to. We were accepted as military brats in Karlsruhe. 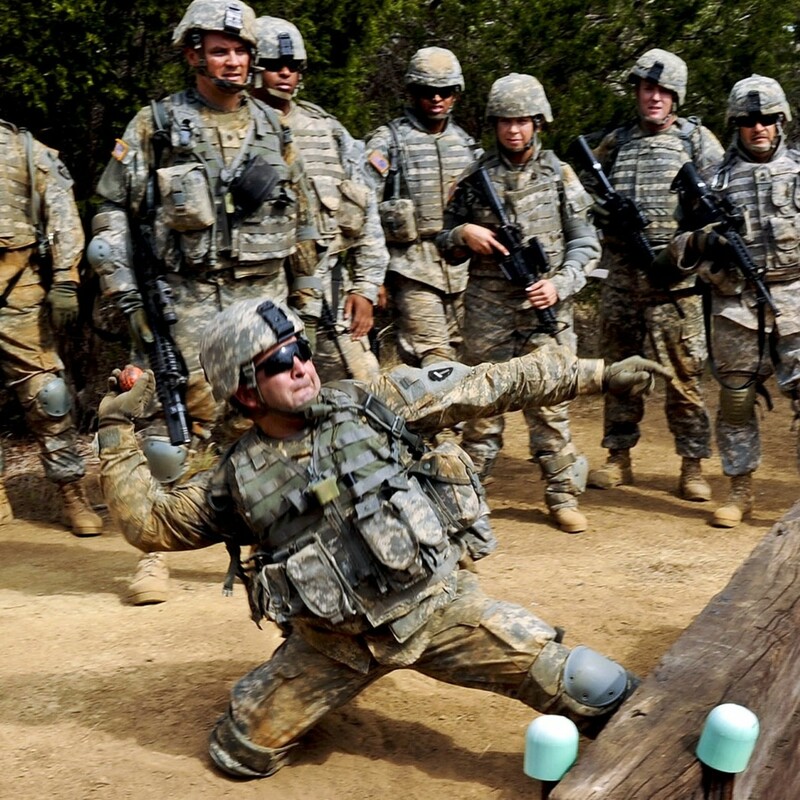 Adapting to new civilian schools was not so easy we weren't always accepted in these schools. If the school was on base it was always easier but when the schools were off base it was not easy. Being military brats even teachers didn't care for us. We were stationed at Ft. Niagara when I was in grade school I knew for sure the teacher didn't like me there. She yelled at me everyday for being late. I wasn't late our bus was late and I sure was not driving the bus. I hope you have enjoyed my memories of Karlsruhe. My friend Tina took pictures of Paul Revere Village for me and sent them. The pictures here are what she sent. The maps are where she shot the pictures. She said the balconies on the apartment buildings were added in 2008. 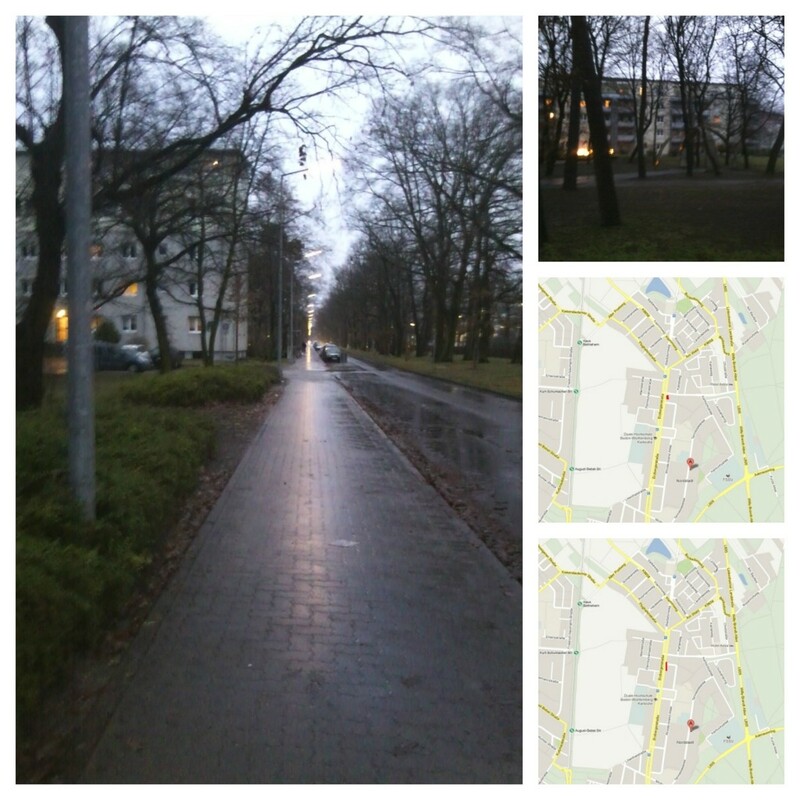 The apartment building is the building I use to live in. She said in the parking lot every Saturday there is a flea market. It was called an ami-fair when the Americans were there. She said her parents went because the loved the American ice cream. It has definitely changed, but it is very pretty I think. I liked this poem and hope you will. I was not only a military brat but a military wife for a very short time. Moving two cars, three kids and one dog...all riding with HER of course. Moving sofas to basements because they won't go in THIS house; Moving curtains that won't fit; Moving jobs and certifications and professional development hours. Moving her most important luggage: her trunk full of memories. Waiting for the new curtains to arrive. She is intimately familiar with drywall anchors and toggle bolts. .....all with ONE Power of Attorney. She welcomes neighbours that don't welcome her. She reinvents her career with every PCS; Locates a house in the desert, The Arctic, Or the deep south. And learns to call them all 'home'. She MAKES them all home. They don't have 15 years to get to know people. Their roots are short but flexible. Accept offers of friendship and favors. The Military Wife has a husband unlike other husbands; his commitment is unique. He's on-call for his country 24/7. But for her, he's the most unreliable guy in town! And so, a Military Wife is a translator for her family and his.She is the long- distance link to keep them informed; the glue that holds them together. But she pulls herself together. You may think it is because she has lost her mind. But actually it is because she has lost her heart . And whose boots in the doorway remind her that as long as he is her Military Husband, She will remain his military wife. And would have it no other way. 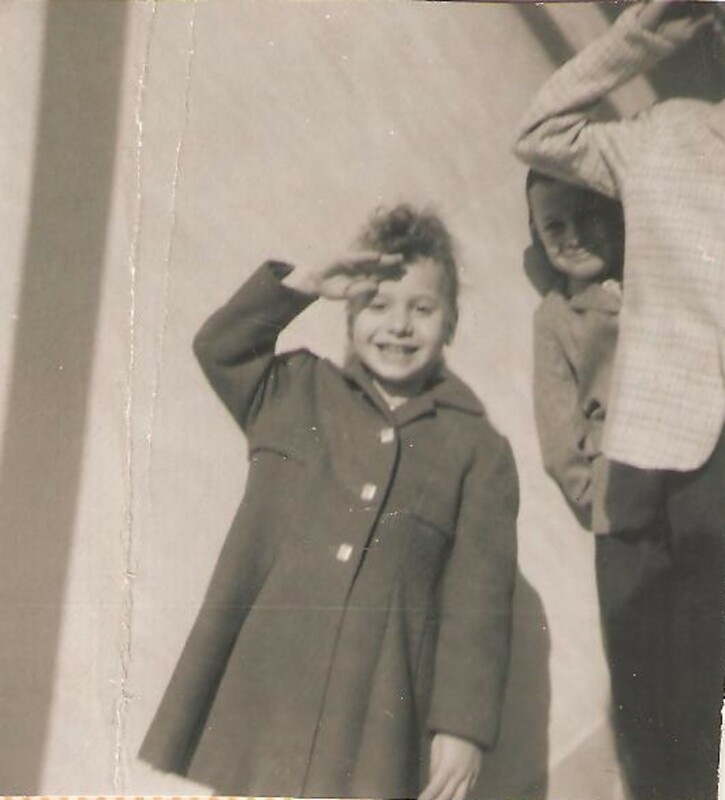 I was a NAVY Brat and lived in Paul Revere Village from1954 to 1956. So amazing to find this page! I was a young child but I even remember the layout of our apartment like it was yesterday. 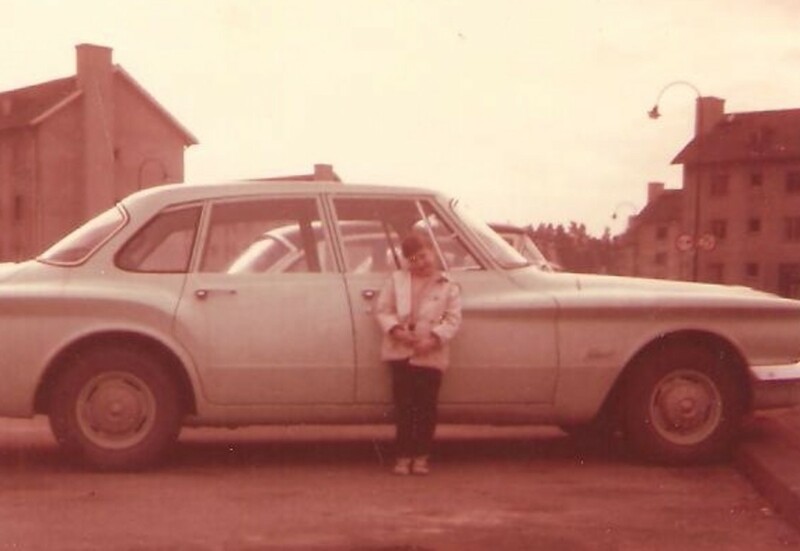 Every time my father had a long weekend we got in our Volkswagen Beetle and traveled around Europe. 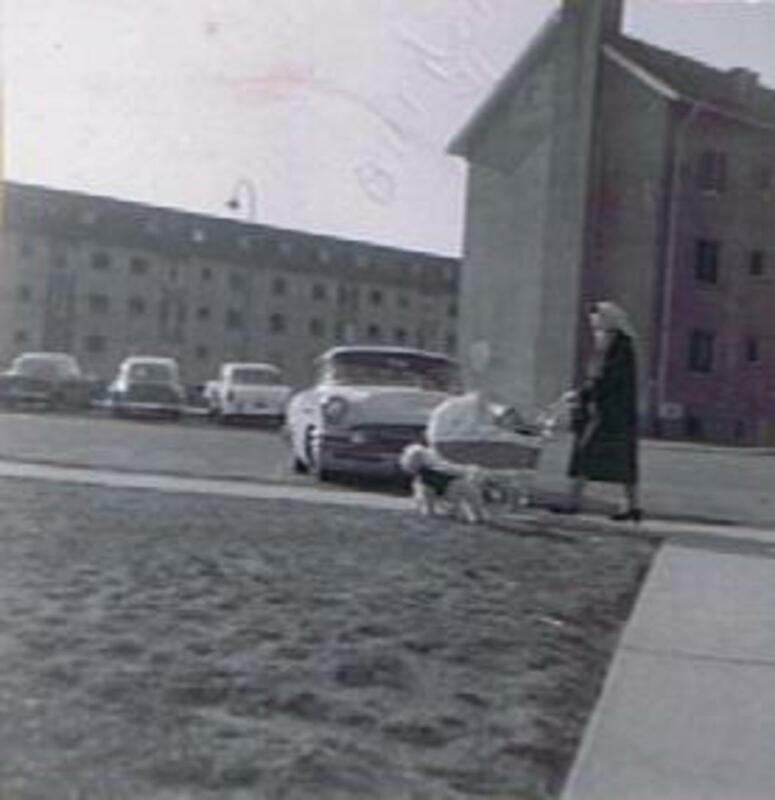 My wife and I resided at 22F Tennessee Strasse (center of building, top floor walk-up) in Paul Revere Village from April 1966 until February 1969; our daughter was born in Heidelburg in 1968 and my wife taught at the elementary school located in the Village. I recall gasoline being about 16 cents per gallon, around the same price as a quart of ice cream purchased at the PX. 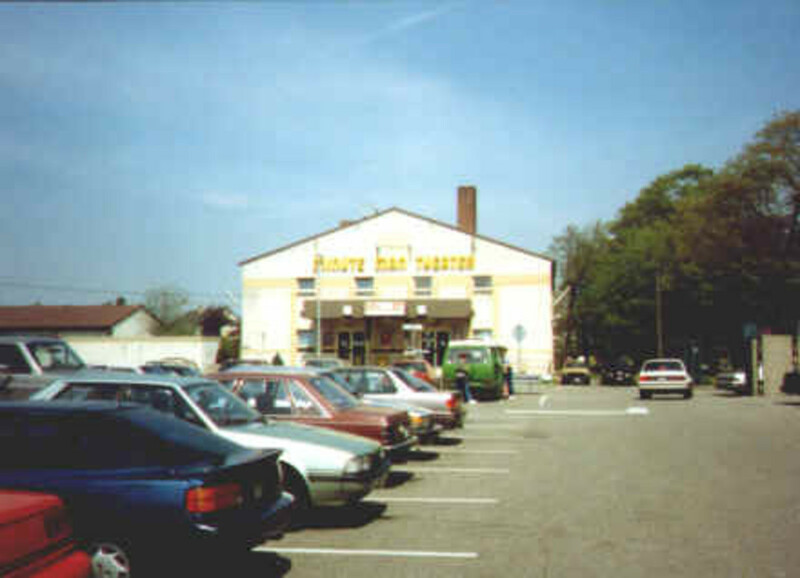 Yes, we spent many Saturday evenings at the Minuteman Theater. We brought our two daughters back there in 1992 when it was still an active military installation. We have remained friendly with another couple we met while stationed in Karlsruhe. Hi, any Army Brats from 1979-82? Such fond memories. Peggy, Thanks for dropping by. No wonder you remember after seeing that wedding. That would stay in a little girls mind. I also appreciate the memories from your adventure. Seems our lives were similar in many ways. Though we only lived there as a child for 1 year it has never left my memories and my love for the place. Maybe someday I can take my kids and grand-kids there. 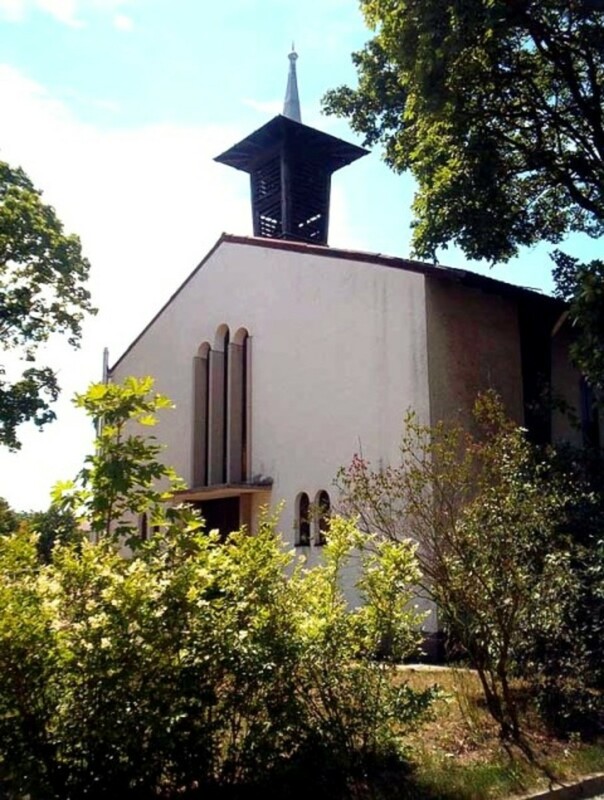 My fondest memory was walking past the Chapel with my mom and witnessed a newlywed couple exiting the church and soldiers on both sides holding up swords as they passed underneath. I told my mom in a loud and excited cry "That will be me someday!" a few years later it happened just like my memory. lutz luhmann, Thank you so much for coming by and telling your nice story. Paul Revere Village was a special place for all of us. 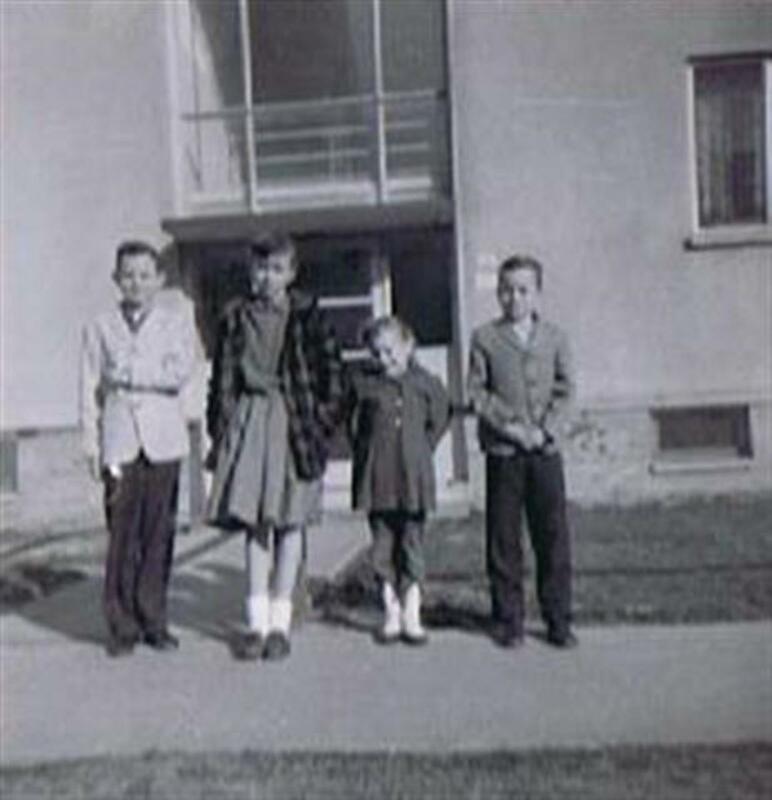 Lived on Tennessee St, May 1955 until October 1956, I was eight when my mother got employment as a maid for the Cordes Family, she also worked for the Heikel family, my best friends were Ray Heikel. and Johnny Cordes, Johnny had a little Schwinn bycicle on which he would zoom down the sidewalks singing the "Naughty Lady from Shady lane. He had a sister Deanna, couple of years older than I. Those seventeen short months in Paul Revere Village on Tennesse St. changed my life and had a profound effect on my direction in life, I recall telling Johnny that one day I would like to visit this incredible place called America, I mean the United States of America. I fondly remember Lt. William Hershiman, and Corporal Richard Wilcox, William H. would take me for a drive in his beautiful 1952 Pontiac two door hardtop, it was caramel color, Richard W. took me for drives in his new 1954 Bick Special, it was metallic maroon. ^The kindness of the American service men and women, I could never put to words it makes me sob like a child, exactly as I am right now, thank you all you wonderful folks God Bless You, God Bless America. Sorry to hear about your relative. I don't know anything about facilities in Karlsruhe for hospice care. Hope you can find a place, good luck and thanks for stopping by. Catherine Astell, Thanks so much for coming by and telling your story. It was very interesting. My father was counter intelligence and was stationed in Berlin in 1961. We went to Berlin in Oct 1962 during the Cuban Missile Crisis. We had about 15 civilians on board with hundreds of G.I. sleeping on the decks. We through a hurricane and the poor G.I.s were so miserable. My brother was on a submarine outside of Cuba. Berlin was a wonderful city to live in and I certainly learned the cost of freedom! Nicole, Thank you so much for stopping by and leaving a comment. I was so happy to hear your story. 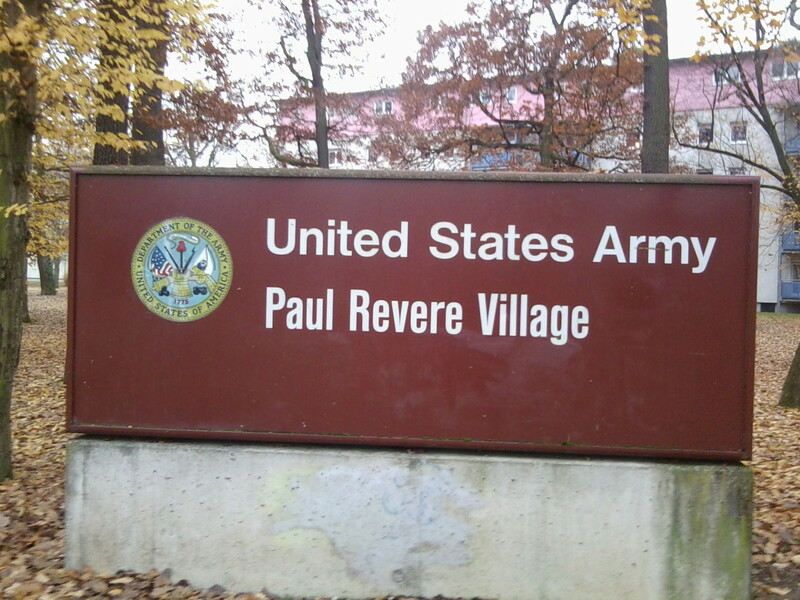 Paul Revere Village was a very special place for all the military brats that lived there. I also hope someday you will get to come to the US. 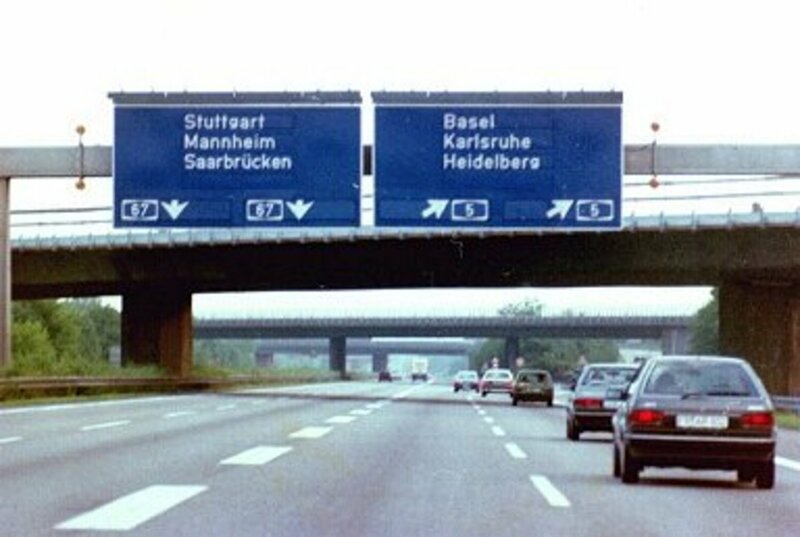 I would someday like to get to Karlsruhe again. larry thank you for coming by. Sorry I was late seeing your post but at Thanksgiving I was very busy. Hope you had a great Thanksgiving. Hey, I really loved reading this, it's so interesting and cool too see how the Paul Revere Village (now mostly called 'Nordstadt') looked like and how it was living there. 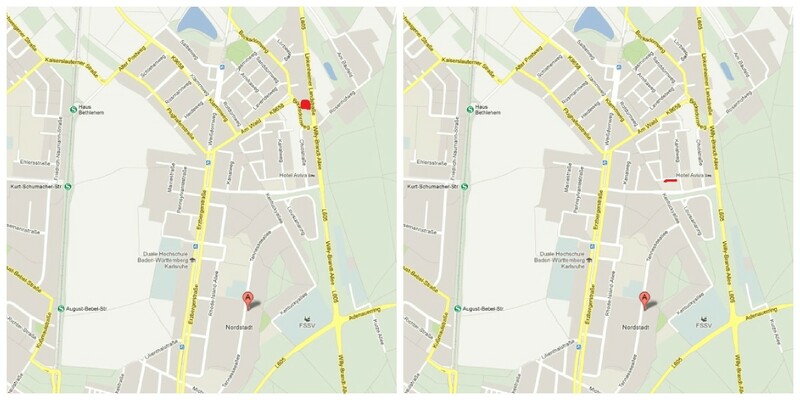 I've been living right next to the McDonalds you marked on the map for exactly 10 years now and when we had just moved there I liked to explore the area and saw all those signs written in English and the street names like 'Tennessee-Allee' and wondered about the meaning of them. 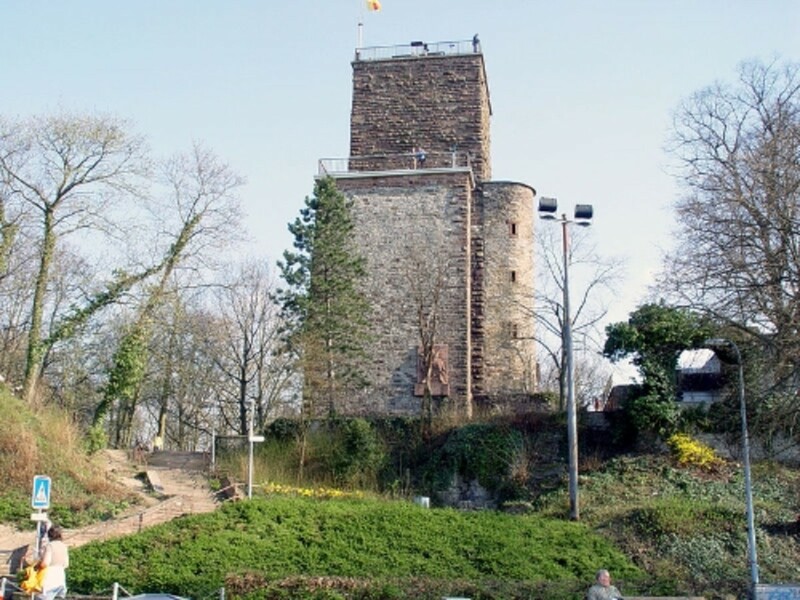 I was 8 or 9 years young at that time and in the following years I've gotten more and more interested in the history of Paul Revere Village and the American influence in Germany, especially Karlsruhe. I did a lot of research, talked to my neighbour who had been living in the area for several decades and I heard many stories about the past but not from Americans who lived in the Paul Revere Village but that was the one thing that actually interested me most. Thanks to your page I've gotten an insight of how living there was, so thank you! I'm currently studying 'American Studies' at a university, I think learning about the Paul Revere Village made me develop a huge interest in the American history and culture and brought me where I am today. I hope that one day I'll be able to visit the US! PS: If you'd like to see pictures of any place in Karlsruhe I'm sure I'd be able to get some! I wanted to wish all my fellow Army Brats a very Happy Thanksgiving! Sure miss Germany..,such fond memories/Fidelitas! Herb, Thank you so glad you enjoyed the pictures. I appreciate you stopping by and leaving a comment. 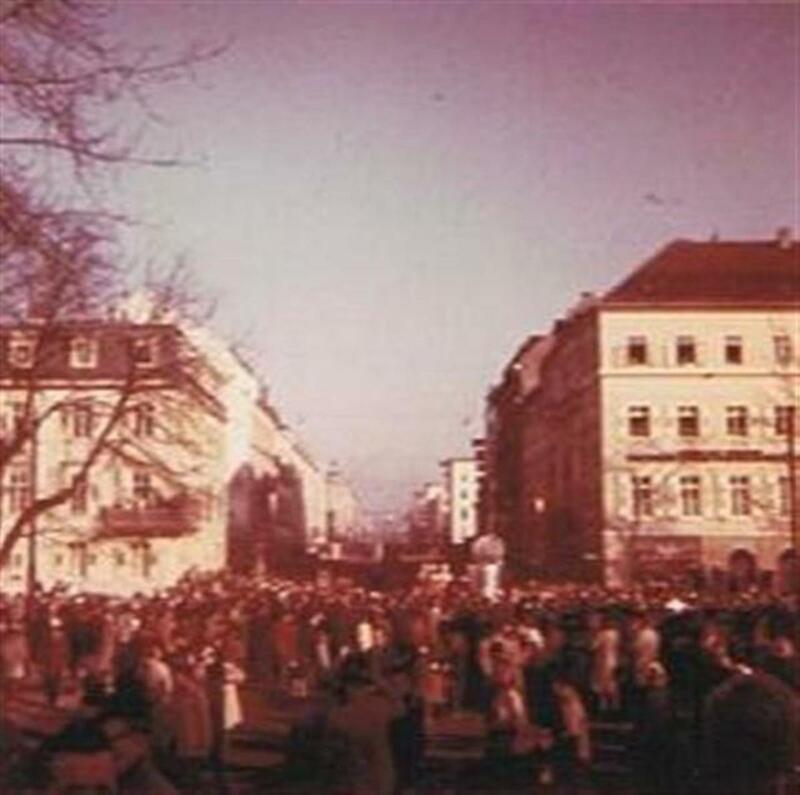 I lived in Karlsruhe from '57-'59. 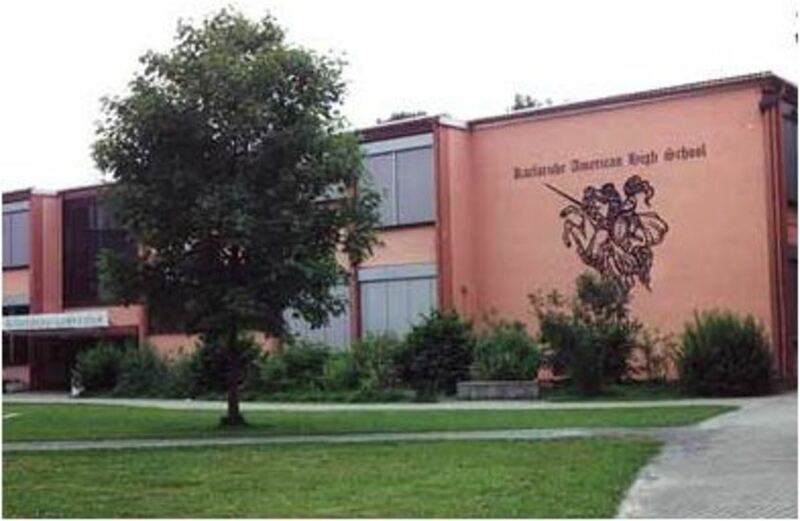 I was in the 6,7,8th grades there. I still remember most of the places in your great pictures. Ended up going back in 62-64. To Mannheim, where I graduated hs. Came back on the uss Geiger . Your pics are great. Brought back a lot of old memories. Thanks. Cindy thanks for telling your story about Karlsruhe. I have't seen a picture of the hospital in Karlsuhe but I will look for one. The prettiest thing we saw on our way back was the Statue of Liberty. My family is from Blytheville, Arkansas. It is a small world. Thank you Moonlake for the wonderful blog. 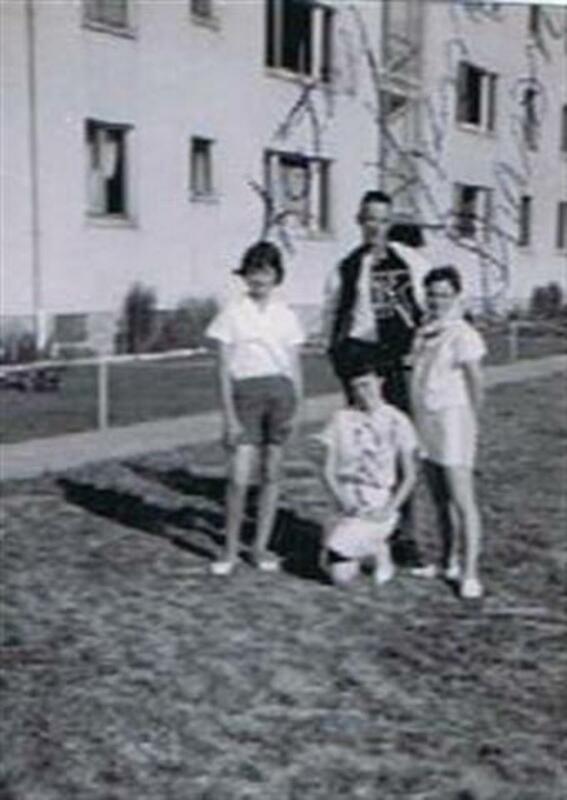 My sister and I were born at the hospital in Karlsruhe, I in 1958, my sister, 18 months later. We were always told the story that we were born in the same hospital that Gen. Patton died in. I wonder if a picture is available anywhere of that hospital? I am so glad you mentioned the USS Darby and Patch. I am assuming we must have come back to the U.S. aboard one of them, but as I was only two, I have no recollection at all. We have no photographs of the ship, though my Mother told stories of how the Officer's were required to dress for dinner, how I used to run all around the ship without apparent effects of seasickness that plagued everyone, and how we saw the Statue of Liberty when we sailed into New York harbor. Probably we travelled on the sleeper train, too. Oddly, my first memory is being on a train with my parents in a sleeping car. After I read your blog, I just had to write, because we were stationed at Ft. Bliss, too. Three times! We roamed the bases too, and I have always maintained that life for a child growing up on Army Bases something I can never say too many good things about. I count myself as very fortunate, and cherish many memories of the experiences. Lastly, one further coincidence, You mentioned moving to Arkansas, and I was curious where, because both of my parents were from there, and I lived there twice briefly, once w hen I was five, and my Father was stationed in Korea, and then again after high school, I attended college for one year at Ark Tech Univ. Small world! Harold Stevens, I remember the fifth floor it was like a big large open space at least that's what it looked like in our building. I see you were on the Darby too. We went to Germany in Dec. in fact we arrived Christmas Eve I remember those choppy waters on the ship. 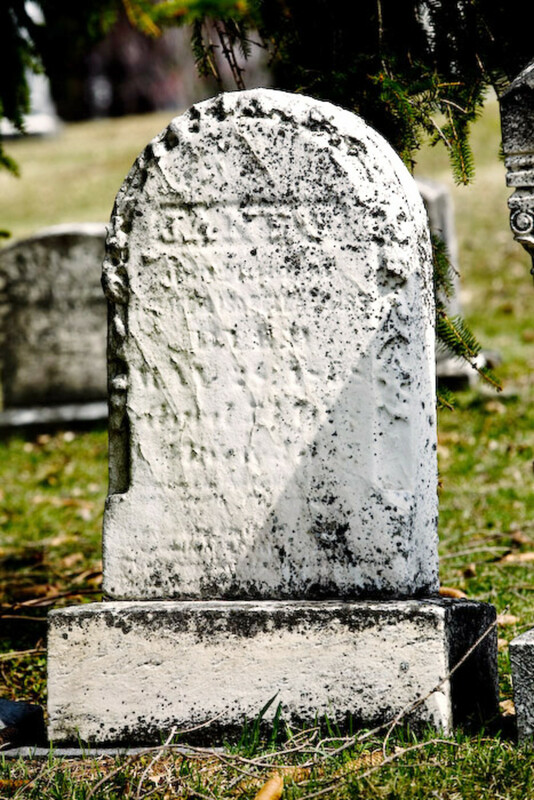 Thanks so much for stopping by with your memories. 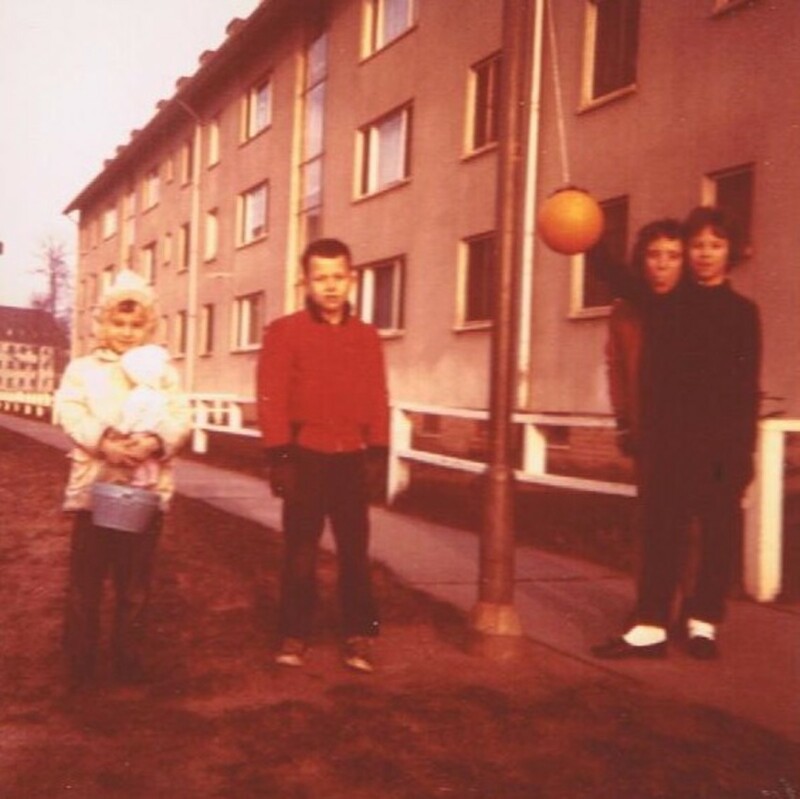 I lived in the military quarters in Karlsrue between Jan. and June 1962. I don't remember which one or even the name of my teacher as I was in the third grade at the time. 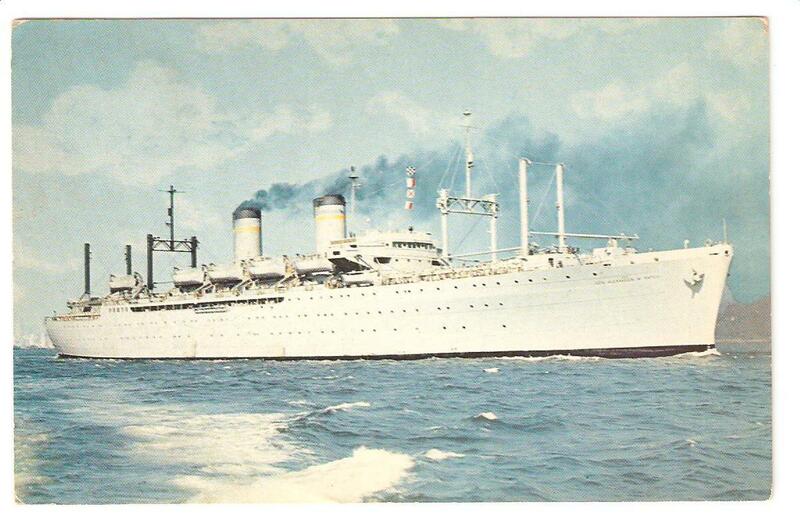 We just came from my grandparents house in Missiouri, spent a few days in a hotel in NYC and boarded the Darby for a wintry, choppy ride across the Atlantic between Christmas and New Year. At first we lived on the fifth floor of the building and moved down to the first floor. Just seeing all of your pictures brought back a flood of memories of another adventure of several as an Army brat. 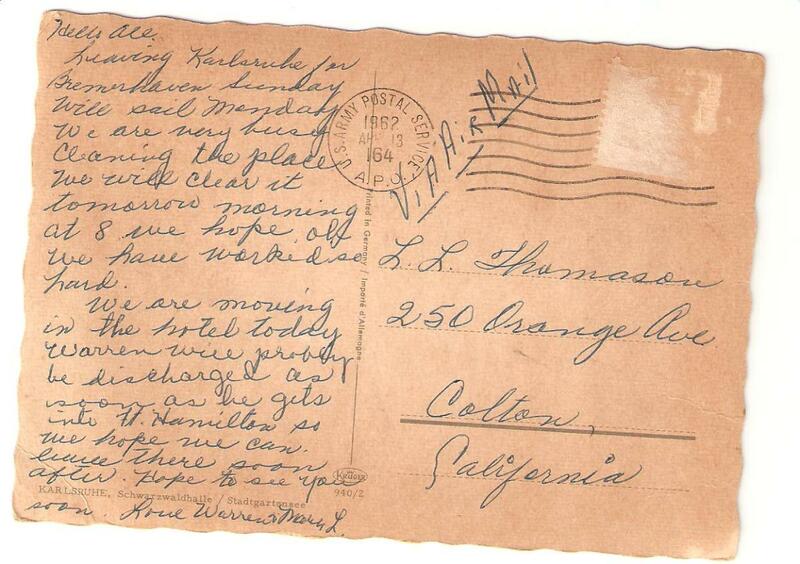 We left after Dad was hospitalized in Landstuhl Army Hospital and sent to Walter Reed in DC. Wow, it always great to see that somebody else lived where you have as a kid. Again, thanks. Rayh57, Your welcome. You had an indoor swimming pool? We didn't have that our pool was at another base we had to go there by bus. 5 years ago from Woodbridge, Va.
Joe Leatham, So nice you stopped by. I left Karlsruhe in 1962 but it sounded the same as when you lived there. We never had the roller skating at Smiley we went to Frankfurt to roller skate. Thanks for your memories. I've enjoyed reading all these posts. 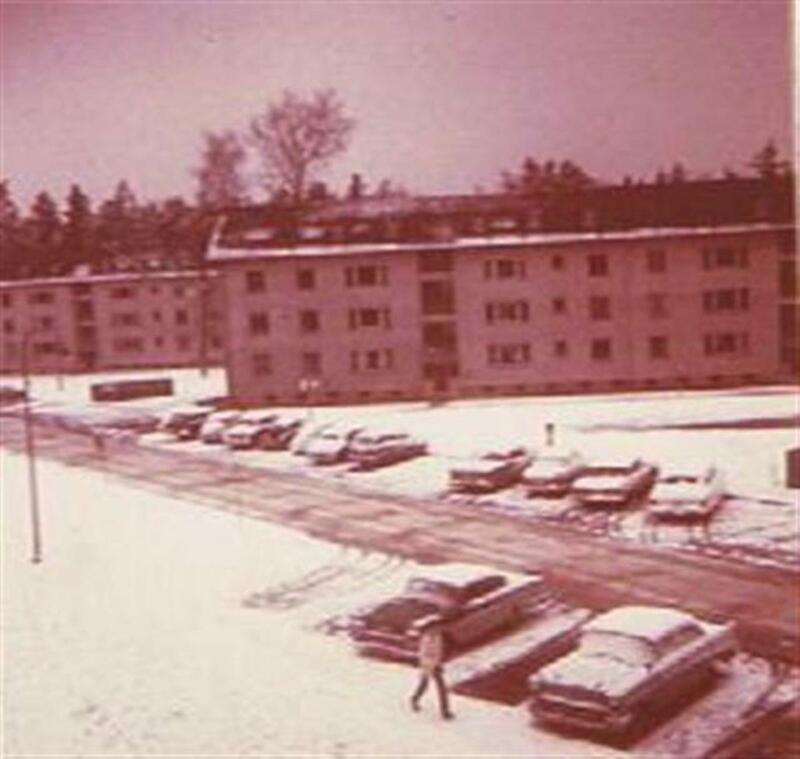 I was stationed in the Army in Karlsruhe from March '71 to March '72, most of that time at Smiley Barracks, across the road from Paul Revere Village and just down the road from the Main Area, as we GIs called it. I still have some ticket stubs from the Minuteman Theater - 35 and 50 cents admission price. I remember sitting upstairs in the snack bar above the PX with those big picture windows overlooking the Main Area, eating cheeseburgers and fries, listening to the latest hits from the States on the jukebox. Also above the PX was a library, an American Express office, and a tailor shop. Outside next to the PX was a post office, a news stand, and the commissary. I walked through Paul Revere Village many times on my way downtown through those woods. I remember the Homecoming bonfire in an empty field in the Village on the last weekend in October of '71 (it was really big! 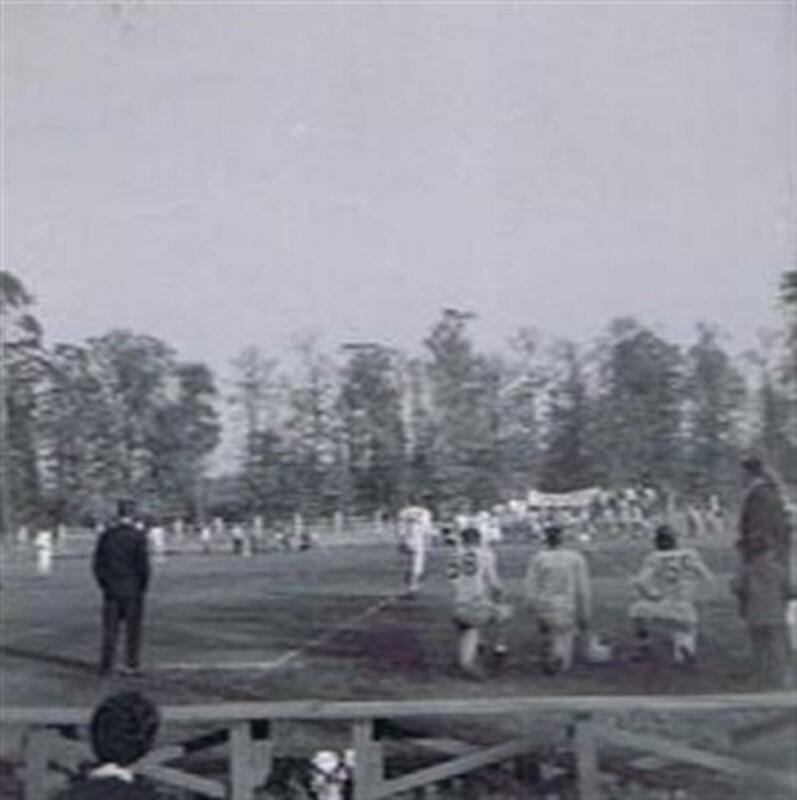 ), watching a high school football game at Smiley, and roller skating with high school kids at the gym at Smiley on Sunday afternoons. I probably left something of myself over there and have some great memories of those times. CraftytotheCore, Things like your doll are remembered I also got a beautiful doll while in Germany. Thanks you so much for stopping by glad you liked the hub. What an amazing Hub! I love how you present the photos in a "slideshow". That's brilliant! I don't know if you know this about me, but I live in a military town. My grandfather was a foundry worker for many years and was sent to Germany. A few executives from the company flew back with him to America and brought me gifts when I was a young girl. They brought me a beautiful baby doll and chocolates. Indian Chef , Thank you so glad you stopped by. Very beautiful pictures. Voting it up. toptendeals, Thanks for stopping by it was a fun and interesting place to live. wpena, Thanks so much for coming by and leaving a very interesting comment. Peter Guenther, also have happy Oct 3 ( Unity Day - 1871 - O. Bismarck) And Nov.9 , the fall of the Wall, to me the greatest day since WWII. 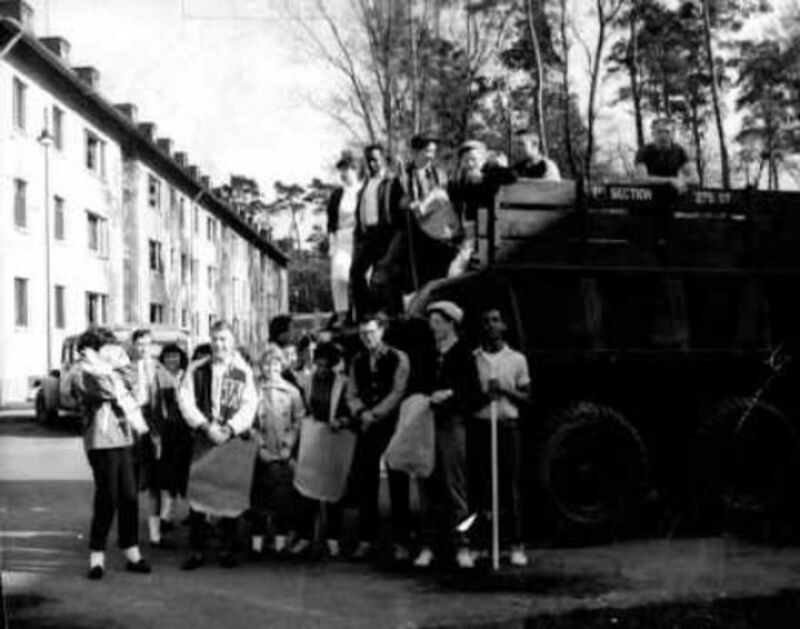 I was stationed (US draftee) in the Gerszewski barracks ( Ettlingen/Karlsruhe) between Apr65- Aug 66 - Love the area and my time there. The story of your father surviving Siberia is quite touching - from what I read very few came back from those Gulags. On the other side, on my wife family some survived WWII's Germany and some did not. I myself left (age 14) a communist country for political reasons - so I understand "Realpolitiks", a term not much used since the Wall fell. Hope you are doing well S.Africa - I would assume you are in your early 70s - so do not go hunting for elephants - I am 67, but will run (maybe leading from behind ) with the bulls in Pamplona next year. PS Moonlake - love your writings and comments - most of the places you mentioned were familiar to me during my short stay - 65-66. ... Oh, came back to the states ( Ft. Hamilton, released in NY) on the last ship - it moved on to the Pacific V. Nam operations after Aug 66. Peter Guenther, A Happy 4th of July to you. To all Karlsruher expats a wonderful and great July 4th. rose-the planner, Thank you and thanks so much for stopping by and for the vote. Peggy W, Thanks for adding this hub to your board I appreciate it. Came back to say that I am adding this to my Germany board on Pinterest and will also share this. This is like a time capsule of memories for you! Nice! 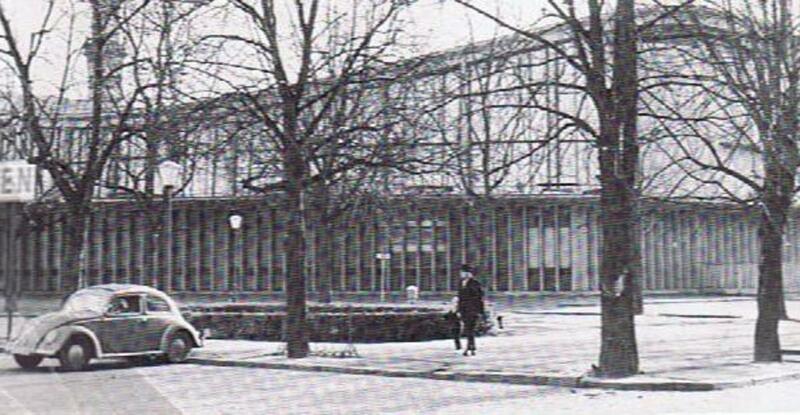 Buckey Miles, Karlsruhe School was really small when you were there. Thanks so much for stopping by and leaving your memories. 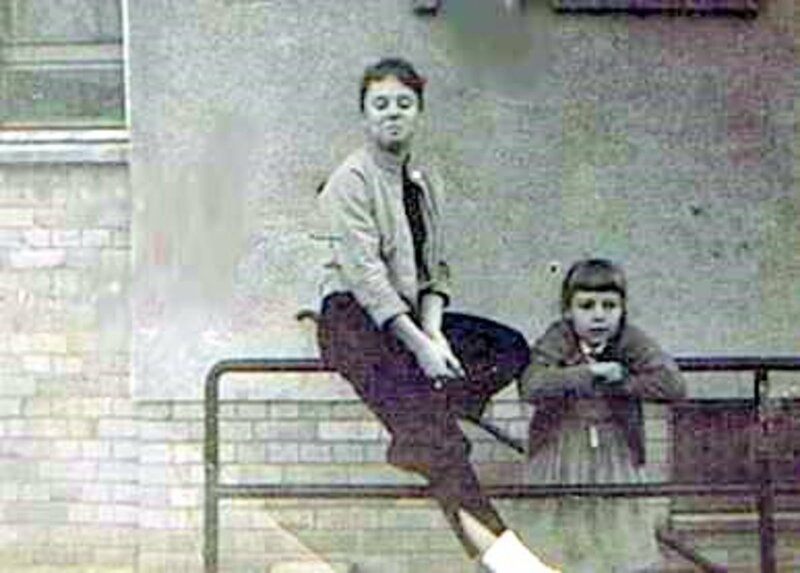 I lived in prv 1954 to 1958 and still have menories of old girlfriends like Barbara Tinder. the bikes rides through the wooded areas playing basketball for the 9th grade Knights we had 6 players on the team and 9 boys in the 9th grade. Janette, I agree it was like a Leave It To Beaver Life. I was a teenager so the snake bar was our hang out. We must have passed each other at some time or another. You were there at the same time I was. Maybe we sat by each other in church. Thanks so much for stopping by and telling your story of Karlsruhe. Indian Chef, Thank you so much for stopping by I appreicate it. Thanks for the vote and share. Moonlake very beautiful picture. I really loved the second one on which a boy has a green paint on the face. Voting it up and sharing on twitter. Peter Guenther, I hope you find them. Have you done a search on facebook seems everyone is on facebook. Thanks for stopping by. In my posting 8 weeks ago I mentioned the friendship my brother and I had with a Sergeant first Class Picket (not sure about the right spelling) and his family. They didn't live in Paul Revere Village but in a part of Karlsruhe called Albsiedlung between Muehlburg and Daxlanden ( :-) Dixiland) . It was in the early 60th . I know there is not a big chance, however who knows. Does anybody here know of them or their about now? Paul Kuehn, I think bases in different countries are better bases. Fort Bliss was a shock when we got home. Thanks for the vote, share and visit. 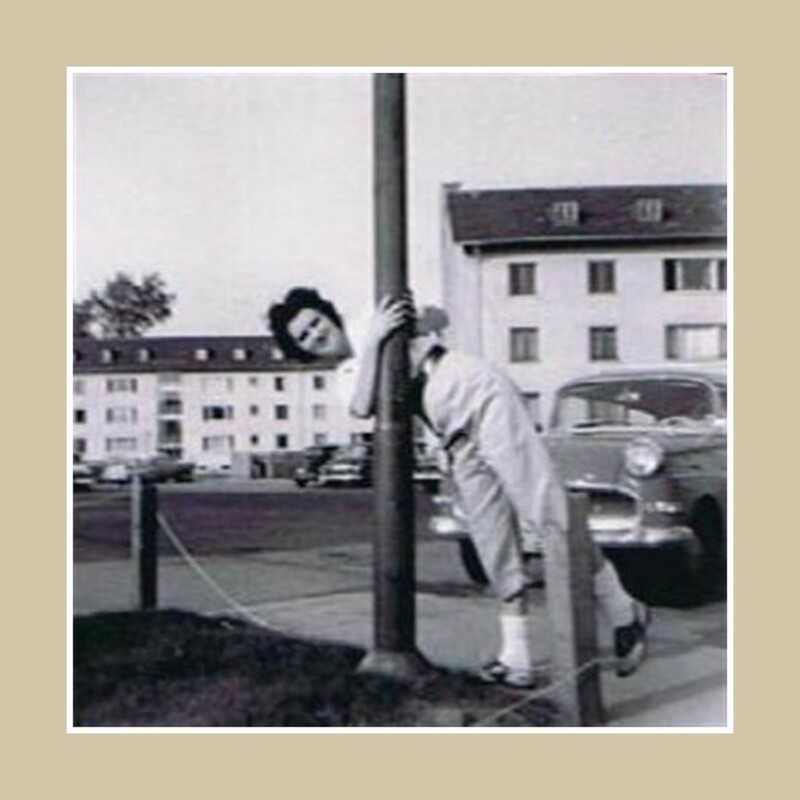 This was certainly a very interesting account of your life on a US Army Base in Karlsruhe. While in the U.S. Navy I lived on two Air Force Bases while overseas. One was on Northern Taiwan, and the other was outside of Fukouka City on the island of Kyushu. I was single at the time, so I never really spent a lot of time on base. When I did, we had commissaries, PXs, snack bars, bowling alleys, and also a nice NCO club. The base on Taiwan where I was 68-70 was a lot better than the bases in the States where I was stationed. Voted up and sharing with followers. Au fait, Thank you I'm glad you liked it. I was the older child so I always had to help mother keep track of the children while traveling. I thought it was fun but I don't think my mother did. Thanks for the vote and share. A great hub! Fabulous photos and how lucky you are to have them! Great story about your experiences and I love the poem. I've never been a military brat or a military wife, but it seems to me your poem expresses what that must be like very well. Voting this up, interesting, awesome, and will share with my followers. Peter Guenther, No it didn't look that way when I there. I wish I had an old picture. Thanks so much for stopping back by. Peter Guenther, what a story you have so glad you came my hub and told your story, I appreciate it. We may have passed each other at one time. Thanks so much for leaving your comment. I have added the picture of the NCO club. Browsing the internet for information’s of my old home town Karlsruhe, I found as well your page. Memories returned. I was and, I am still a friend of the US of America. I have to go back to my early childhood to explain the reasons how it all began. At the end of WWII we leaved in a foresters house in the middle of a forest some 3 miles from the next town. I was only 5 years old and remember the arriving of the first American Sherman tanks. We where only 3 women my brother and myself. We where all very afraid. The first tank stopped right in front of us, two soldiers came to us with oranges and chocolates in their hands. I never saw this things in my life before. The Americans camped for the next days in front and we kids mingled with them and found it all very interesting. Suddenly a German Me109 flew over us and started to shoot. My brother and I stood right in the open not knowing what was going on as two American soldiers crapped us, risking their own lives, and pulled us to safety. The American soldiers behaved at all times like real gentleman to the women. As my father came back from Siberia, where he was a POW for nearly 5 years, we returned to Karlsruhe from where we have been evacuated during the last year of the war. 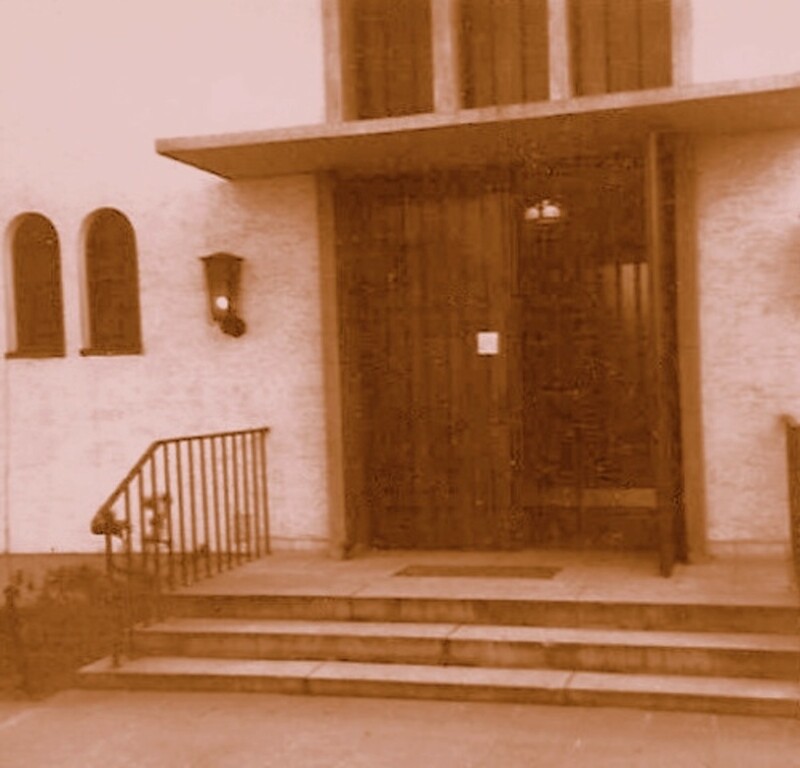 In the early 1960’s I made many friends with American soldiers and my favourite hang out was the NCO club in the Erzberger strasse. My brother and I had in those days a very good friendship with a Master Sergeant first class Picket and his family. We never faltered in our believes in the USA and never will. I live now since 35 years in Richards Bay on the east coast of South Africa. Thank you for bringing back lots of great memories. Funny I remember so much of what you mention here. The French compound did always seem to be eerie and foggy. 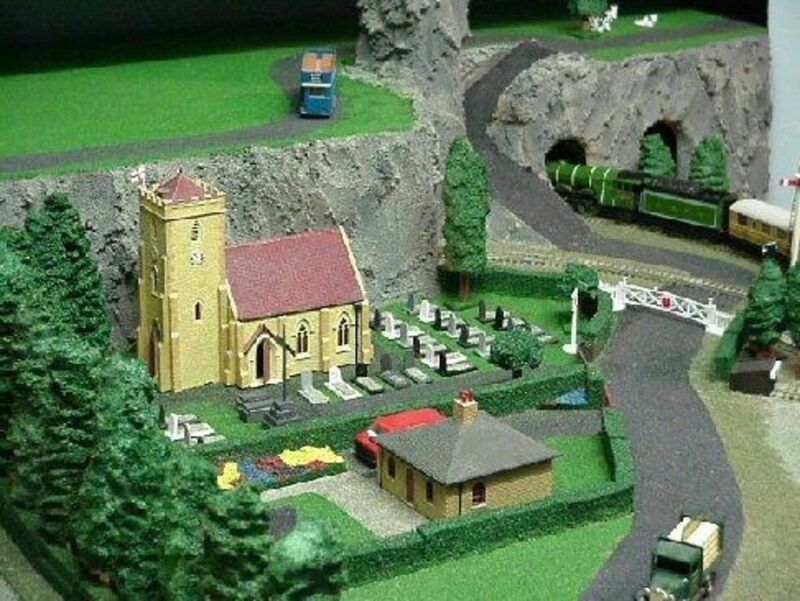 Do you remember how fast the trains were? There were two young mothers and they put their kids on the train and went to get their luggage and the train took off. They were so upset; we had been on ship with them. They did get the kids back. When we got off the train there was a drunk on the park bench passed out. I thought my Mom was going to have a heart attack. She doesn't believe in drinking and she thought what god forsaken country have we moved to. She never did learn to love it. The kids in the family did. Hope you enjoyed the new pictures of Karlsruhe I have a coupe more to put up. Thanks so much for stopping back by. Just checking back in to read posts. I also had Miss Sommer for a teacher now I cant remember if she was my regular teacher or my German teacher. I think my German teacher was from Austria. We took the USS Darby from New York to Bremerhaven. I remember the ship stopping and being guided into the harbor and the strong smell of diesel. We took the train from Bremerhaven to Karlsruhe. My mom of course didn't speak German even though we had been stationed there prev. I remember eating sugar cookies and being a bit confused. Everyone speaking German. When we arrived in Karlsruhe we too lived on the "economy" Had a cobblestone road leading into a square. There was a Hofbrau on one side and a little building that served as a slaughter house. We lived over that and would watch one of the German women bring a pig down the path and then well, I will leave it at that. There a German kid that had a German Shepard. My brother used to play catch with the boy. He seemed to always be a bit abusive to the dog so my brother at one point motioned not to hit the dog. That was a mistake the poor dog bit my brother and as my dad was on maneuvers they took my brother to the dispensary in an old army truck. What a life! It was so normal wasn't it for all of us. Wouldn't trade those years for anything. My dad used to take us to the French compound. It was so eerie. I remember it was night, foggy and flood lights. As I mentioned previously we used to play in some old bunkers but cannot remember if off base or on. Trading comic books and baseball cards and playing marbles with the German kids. We were there during the Cuban missile crisis, very scary for my mom. She knew if anything happened we would not get a foot out of West Germany. shirley, Yes I remember the train from Bremenhaven to Karlsruhe. I had never been on anything like that and looking out the window seeing the strange cities to us pass by. I do wonder where the name ecomony came from. Isn't it funny the teachers we remember the most I think are teachers that read stories to us even if it was a chapter a day. Thanks so much for stopping by and leaving a comments I appreciate it. Wow this is great. I sent an email but I will also post on comments. Yes 1963/64 till 1967/68. 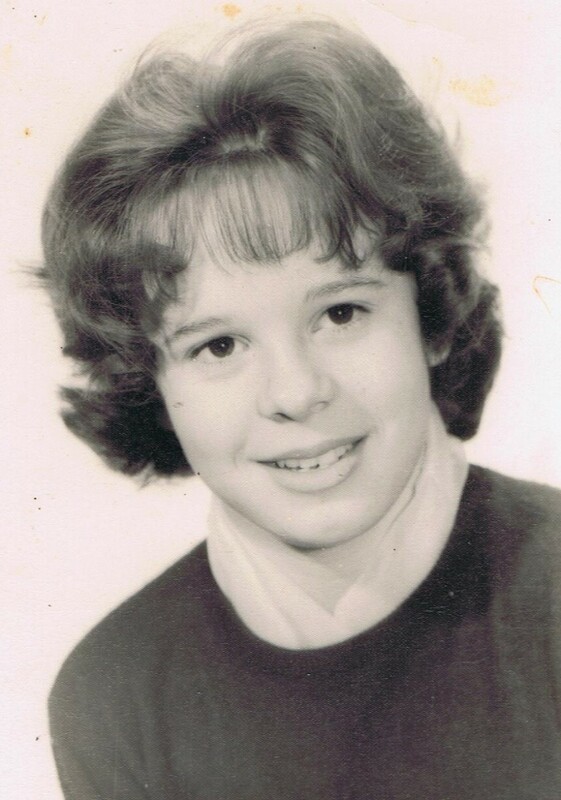 Lived in Neureut (ecomony -who came up with that word) And went to school on post picked up by a military bus. The driver would stop at a bakery and get us candy sometimes. Trying to remember some teachers - Ms Cooper - we had to learn to speed read per a camara looking machine - (and yes it worked -I can read a book in no time flat.) And Ms Loesch 4th - She would read at the end of the day to us out of a book - 2/3 chapters at a time I remember "The Island Stallion" like it was yesterday. 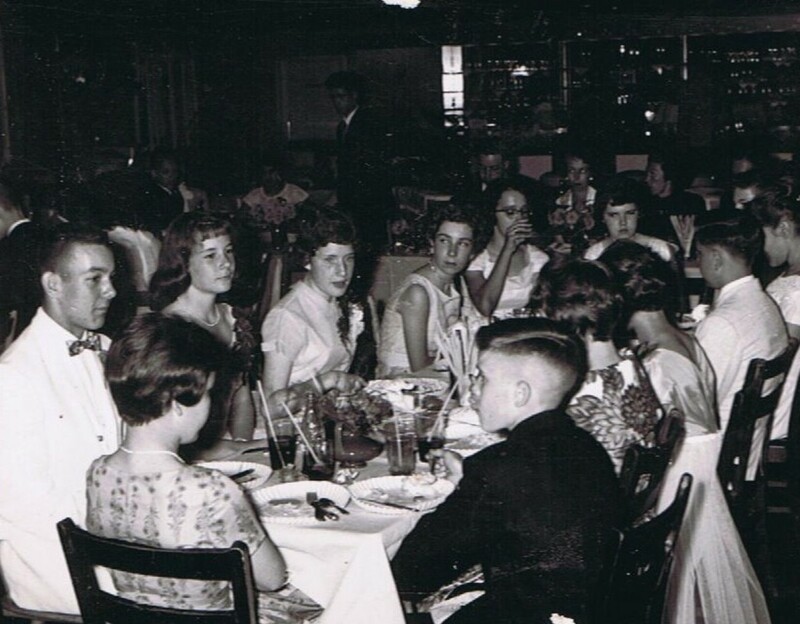 Miss La Rosa -5th grade And the AYA - didn't it serve lunch for the students ?- we had to walk over there - one of my best friends Susan would order the fried egg sandwhich which they served on Fridays only. My first boyfriend too - Lernard- lasted only a day LOL I don't have any year books and few pictures. And yes we were in Brooklyn also (got a pic of us under the bridge) took The USS Rose to Bremenhaven and the train to Karlsruhe. 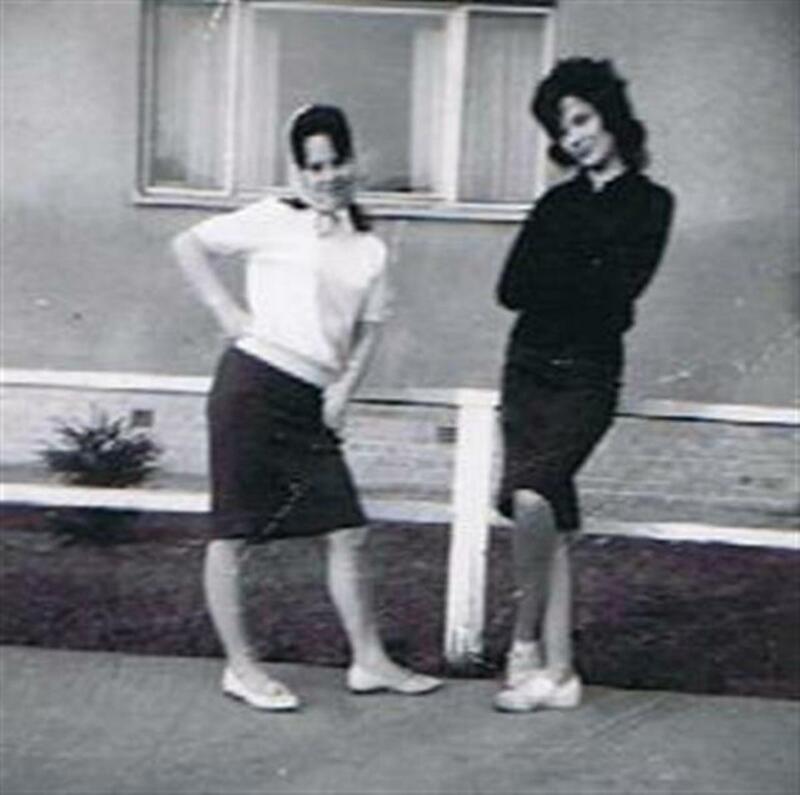 It would be so crazy to find my best friend Denise and Susan. 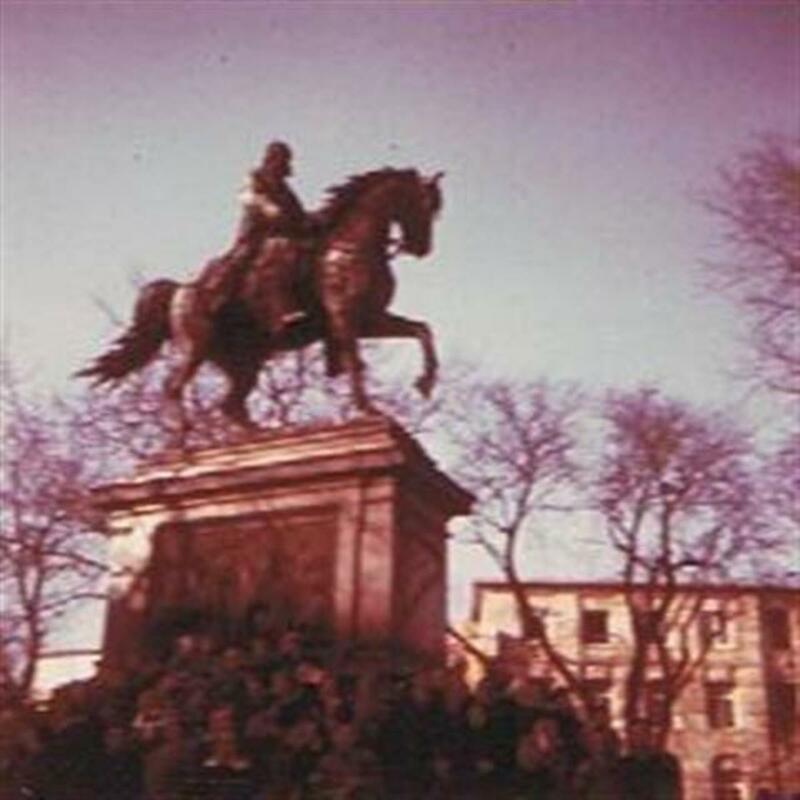 Karinjoie, Thanks so much for stopping by and leaving a comment and your memories of Paul Revere. We were back in the states by the time Kennedy was assassinated. Loved reading your story! I lived on Paul Revere Village in 1963-1964 (Connecticut Street) just across the park from the movie theater and across the street from the commisary and PX. Loved that base! My sisters, our friends and I would often walk to the candy store down the street where 25 cents "American" would buy a boatload of candy! 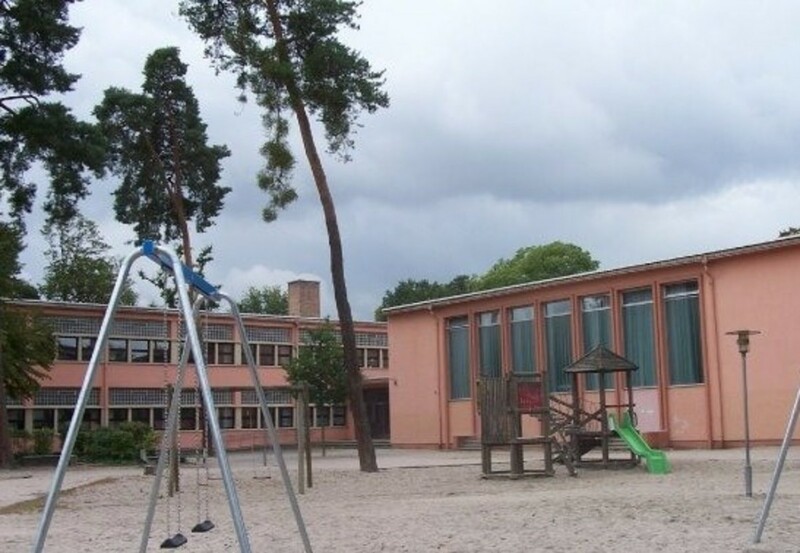 Went to the elementary school on base, teacher's name was Frau Sommer. Nothing but great memories of our time in Germany. 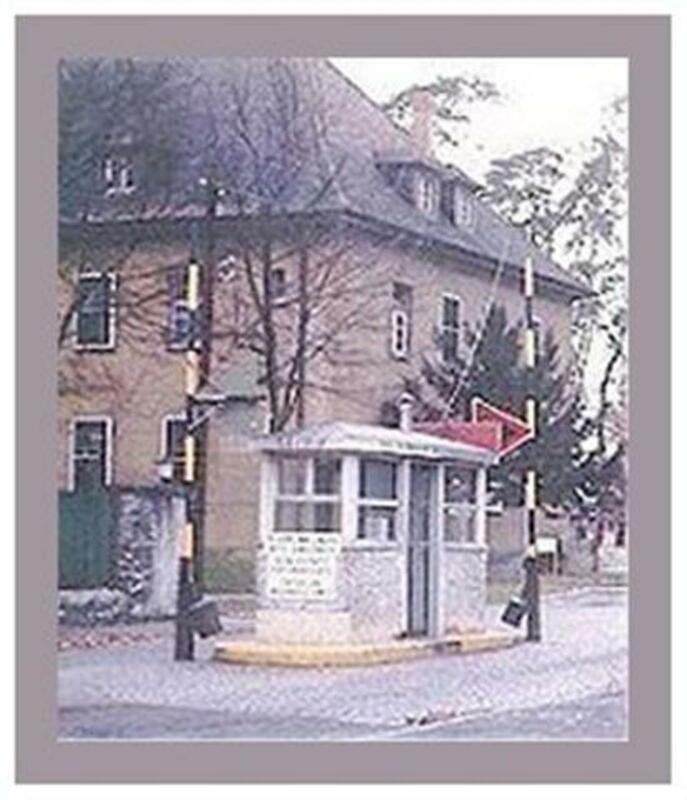 Actually was on that base the day (the evening in Germany) Kennedy was assassinated and can still remember how the MPs came to the house to get my dad because the base was on lock down. All of our moms were so upset, sad and scared. Everything's so different now; news is so immediate. Thanks for sharing all the photos, old and new! 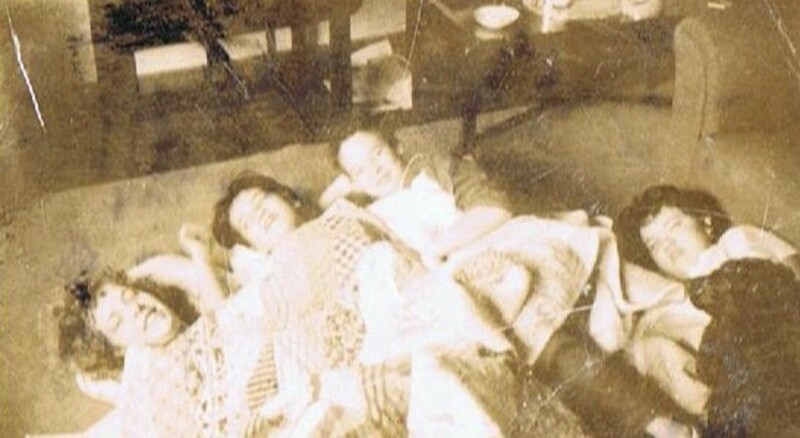 Peggy W, We were told never to go passed the french compound because it was dangerous and they would crab young girls. I don't know how true that was but we were always careful (I never once heard about that happening to any girl). I don't know where the story started. We could see all the way down the sidewalk pass the compound so we looked first than ran as fast as we could. When it was dark it was always creepy even though there were low light street lights. Thanks so much for stopping and for the vote. It sounds as though you had a lot of fun in Karlsruhe, Germany as a child (military brat). And you were quite the dare-devil back then! Ha! Really enjoyed seeing all of your photos and hearing about your memories. Question...why was it you were not supposed to pass the French compound? Voted up and interesting. Mike Fergusonm, Thank you so much for your memories. I had a friend that also lived on economy it was a little scary getting to her house at night. My brothers also hung out at the beer tent probably doing the same thing you were doing. It was a fun place to live. What a wonderful memory lane - I need to walk through more of the comments above, but I just wanted to say I was there in 1965-66. 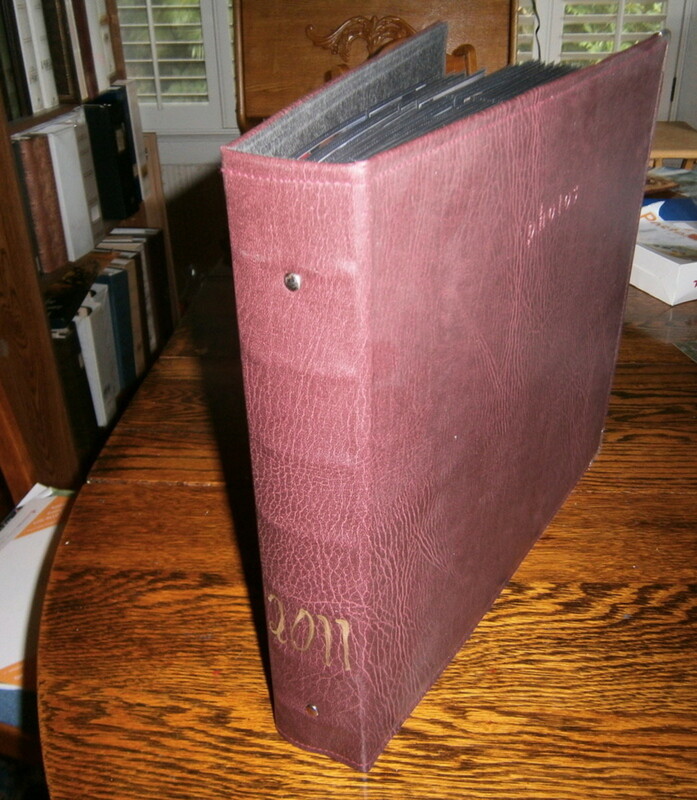 My dad was a 'civilian' but working for the army so I went to school on the base [and still treasure my yearbook!]. Had some great times on the base and, as we referred to it then, the 'economy'. 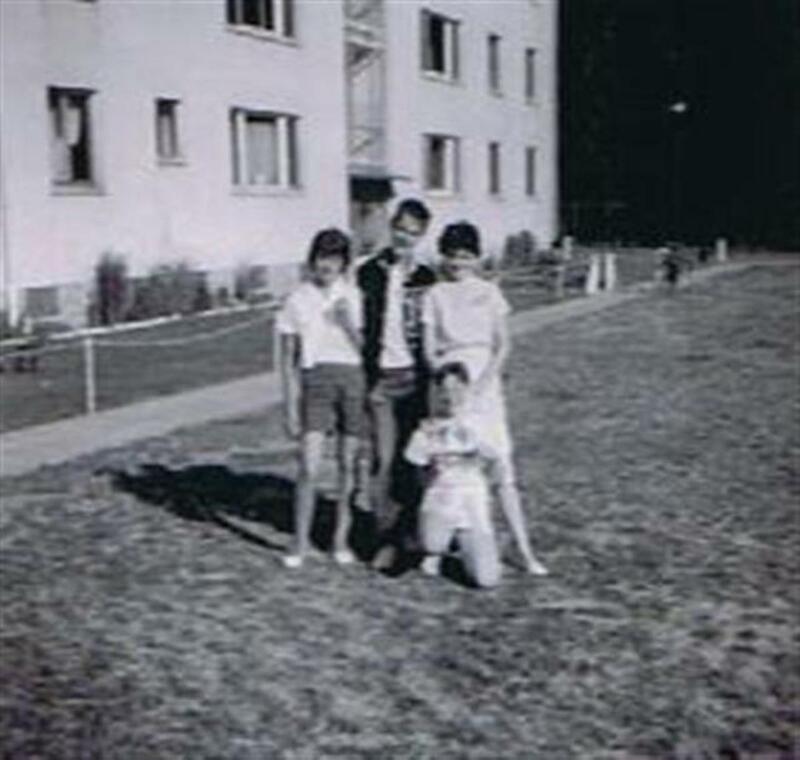 We first lived in Durlach, and then moved into Karlsruhe at 49 Garten Strausse, if memory serves. I found this posting as I was searching any information about the Little League baseball team I played in, the Orioles. Just been writing about that. 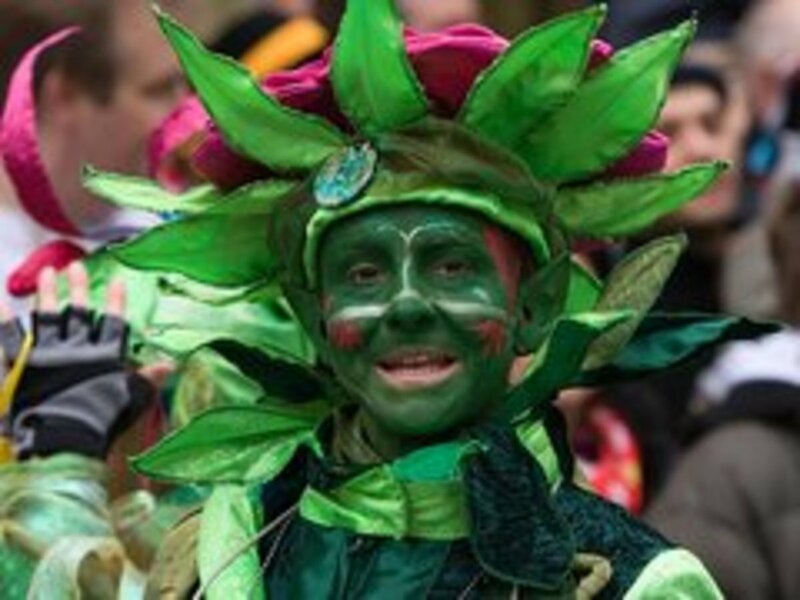 I loved Fasching! I was 12 and thought it was outrageous! I remember the policeman who used to direct the traffic from a box in the middle of the road wore a Groucho Marx glasses and mustache during this. I thought that was so cool. Fell in love with Ruth Sontag for one day during the Festival. She was 14 and we didn't understand a word either said. Used to go to the beer tent at the carnival and returned the beer bottles and got paid the refund. Made loads. That was cool too! Had some great teachers and some of that experience will have been influential in my becoming a teacher. I moved to England in 1967, and after a very brief return to Nebraska, I moved back and still live here in Devon, England. Very informative period, and as someone commented above, it was a peaceful, idyllic time. I've never been back, but must do one day. Larry, Thank you for stopping back by. Maybe someone will find you on here. Hi...Just wanted to make a correction. My friends name was Jerry Erskine..Also remember a few more friends. The Butlars, Barry, Valerie and Vanessa. 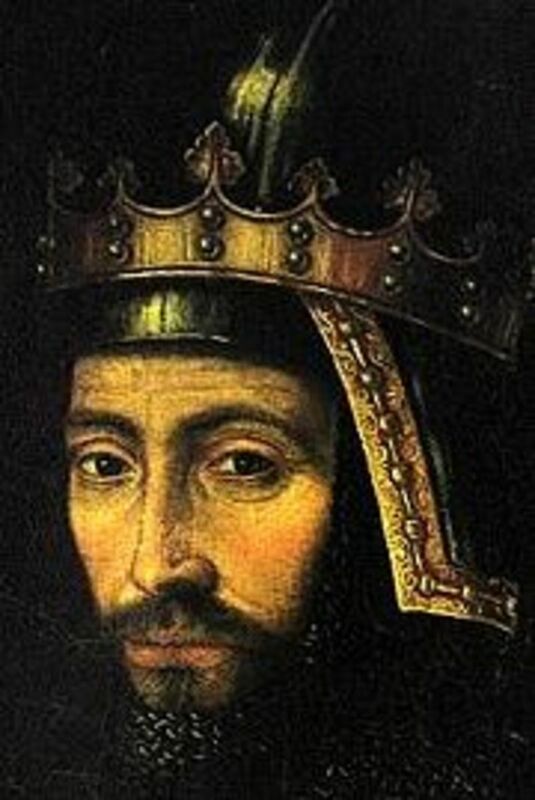 Was another brother also but cannot remember his name. Also a Pixie and Dixie were in my classes.Who knows someone that travels by here might remember crossing paths. Also we went to Ft Lewis after Karlsruhe. Were only there for 1 year. larry, Thanks for stopping by. We were at my brother's in Mn a couple weeks ago and he was talking about how they use to play in the bunkers and started a fire in one and got in trouble. I had two brothers just a year apart so they hung out together. That scary old basement we all remember that. I think kids on the base were care free kids that could run around and have fun. I appreciate your comment. Hello fellow Army brats! This is a re-post/hope that is ok. Richard Hooper,we too were in Karlsruhe around same time you were but left by "64" I also played for the "Pirates" although for a short time. My dad might hv been the coach. I can't remember. 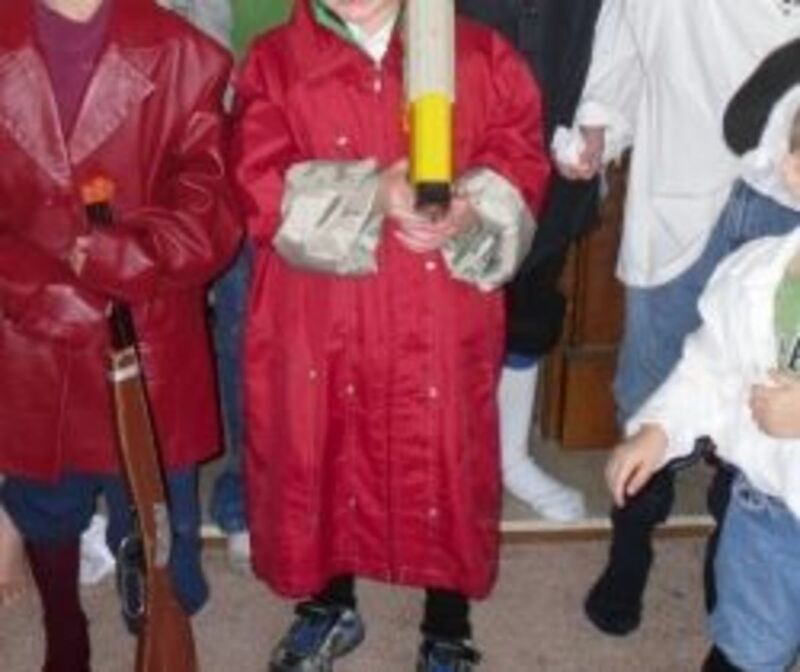 Baseball wasn't my thing. I threw with my left hand and caught with my left hand. So I took up soccer later on.lol! We lived at 31 Tennessee st. I was in 1st-3rd I do believe and teachers were Miss Sommer and Miss Amotuli. Not sure of spelling. My good friends were James Doswell,his dad was our dentist and other friend was Jimmy Erskine. 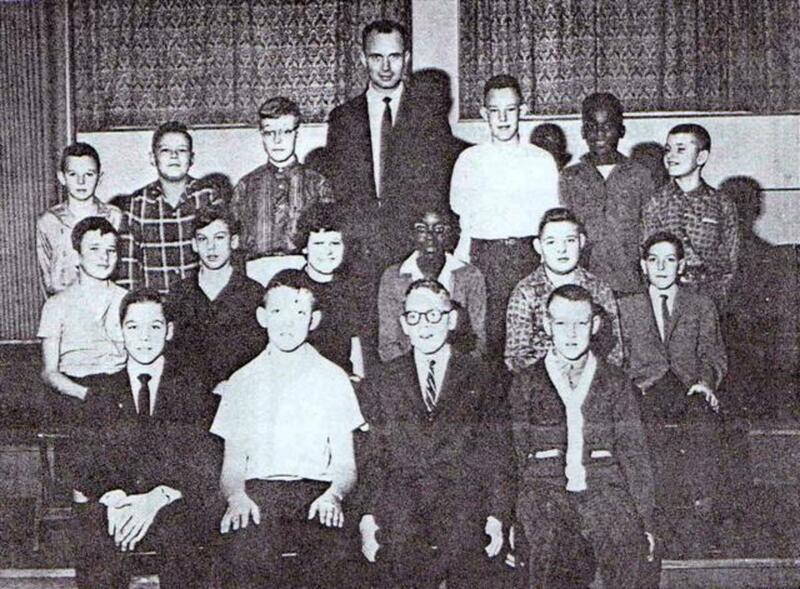 Was in cub scouts with the Grammers and my brother Ron had a friend named Leslie Lenhardt. He lived in building next to us I think. His sister used to babysit me when I was 6 or 7. Some of us used to play in bunkers but had sign that said Verboten. That's prob why we did it but it sure was fun. As I mentioned before we would get tires,go to basement and roll them back and forth. First time was scarey as we always thought there was someone hiding in space going into the laundry room. We couldn't wait for the truck to come and fill up the sandbox and playing marbles with the German kids. They always had clay marbles and were easy to beat. Also a German man would come by in a truck and sell toys out of the back. 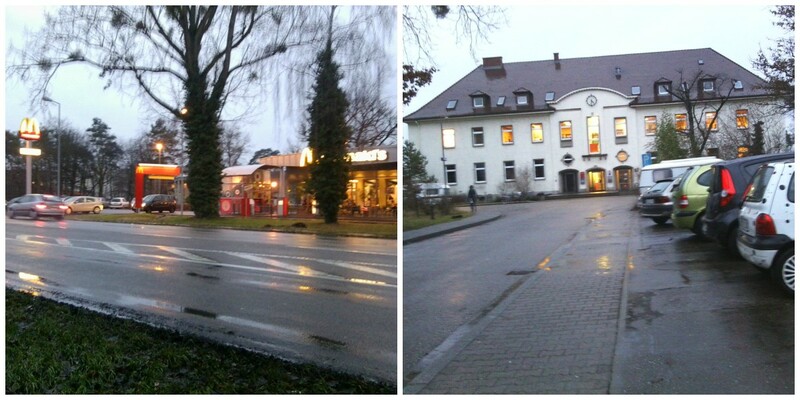 We also would go off base to get candy but had to walk through an area that if I remember correctly was a German park. One time this man pulled a knife on us..We ran as fast as we could. I tell my children these stories and they can't believe some of the things we did. What a life we Army brats had. Would not trade it for anything. As many have said. When I had to go to civilian school I was totally lost. We all were so lucky!!! tina, So glad to have you stop by I would love to get pictures of Paul Revere Village. I will send you an email. Thanks so much for your comment. and i will send you the actually pictures of the street you lived and the paul revere village. hmcclure, Thank you so much for coming back and leaving a comment. Brats are different that is for sure. I hated state side schools. 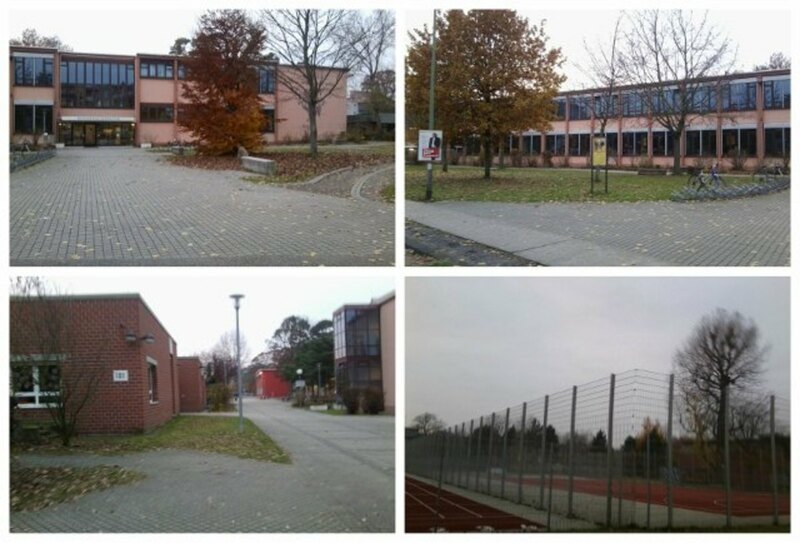 I was never lost in our school in Karlsruhe but I was always lost in the new schools stateside. Just way to big. Was there from 1961-1964, have been reading all the comments and even found the one I wrote 3 years ago, seems we all hated the basement. Being a "brat" does cause you to be a little different from others, fitting into stateside schools is hard because not only are you the new kid but unless you are near a base you are really a whole different breed (or so they think). Thank you for the pictures, enjoyed seeing them and the memories they brought back. Brooke, It was a great place and I guess we all miss it. I know many people are looking for the candy they sold on the candy truck there. Thanks so much for stopping by and leaving a comment. 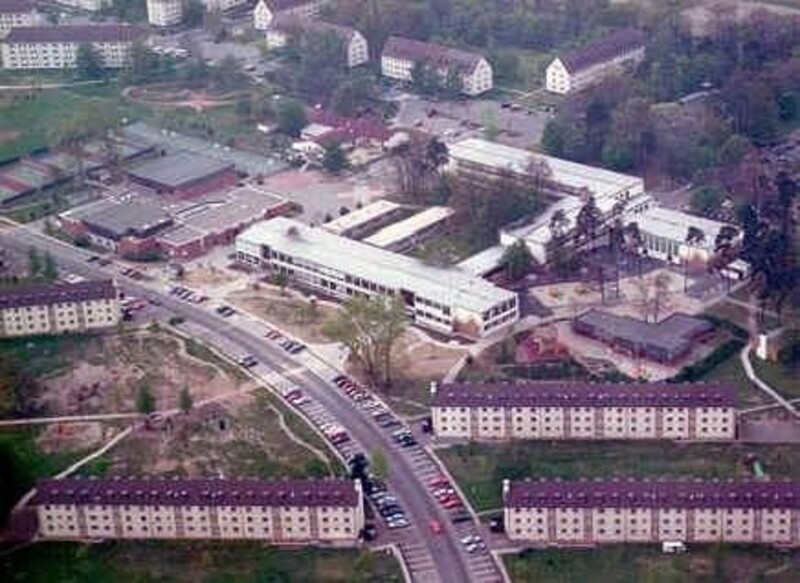 I lived in Karlsruhe on the army base for 2nd, 3rd and 4th grade, i think that's a photo of my school. I loved that base! The candy truck would come, you could hear the church bells ring, you could play with other kids and feel safe, it was nice living on a base. I remember you could get your i.d. card when you were 10 and go to the commisary by YOURSELF, however I turned 10 the year after we left, so never got to do that. My mom would bring us ice skating there too. That was such a great place! NAYDA CIRILLI-STAHL, Thank you so much for stopping by and leaving a comment. I wish we could all go back and visit and see it the way it use to be. I appreciate your comment. For the first time in almost fifty years memories from the past were coming back today why, for which reason, there is no reply to this. Planning a trip to Karlsruhe, (maybe this is the reason) after almost a half of a century, I simply wanted to know if Paul Revere Village still existed as I lived there as a young wife of a young American sergeant from October (I don't remember the exact month any longer) 1965 until September 1966 when orders came to move to Fort Lewis in Washington State. Bill and I used to live in one apartment located in one of the buildings on the left side of the church, as a young wife and as an Italian citizen, living in the village was quite an experience. It is indeed very sad that the village no longer exists, and I thank you for giving it a second chance of being alive. It has been a very emotional moment looking at the pictures and reading through all the different experiences and memories while time suddenly has taken a different dimension. Thank you again for your time and patience and thank you to all of you for your comments to keep alive wonderful memories and places of once upon a time. gene turner, Thanks for stopping by. Maybe someone will see your message and let you know where she is. i was there in 1971 thru 1974. on the knights soccer team ,as a goal kepper. belive we had a great team. looking for my long lost sweethart, kathy davidson. can anyone help? williesmiley60, Maybe your friend will show up here and leave a message for you. Thanks so much for stopping I appreciate you leaving a comment. Thank you for youe beautiful pictures and sharing your memories as well as mines. I also lived in Karlsrue in the early 70's Paul Revere./ I lost contact with my best friend marianne, forgot her last name. She visit me in the USA her first visit, for the arrival of my first born chils. 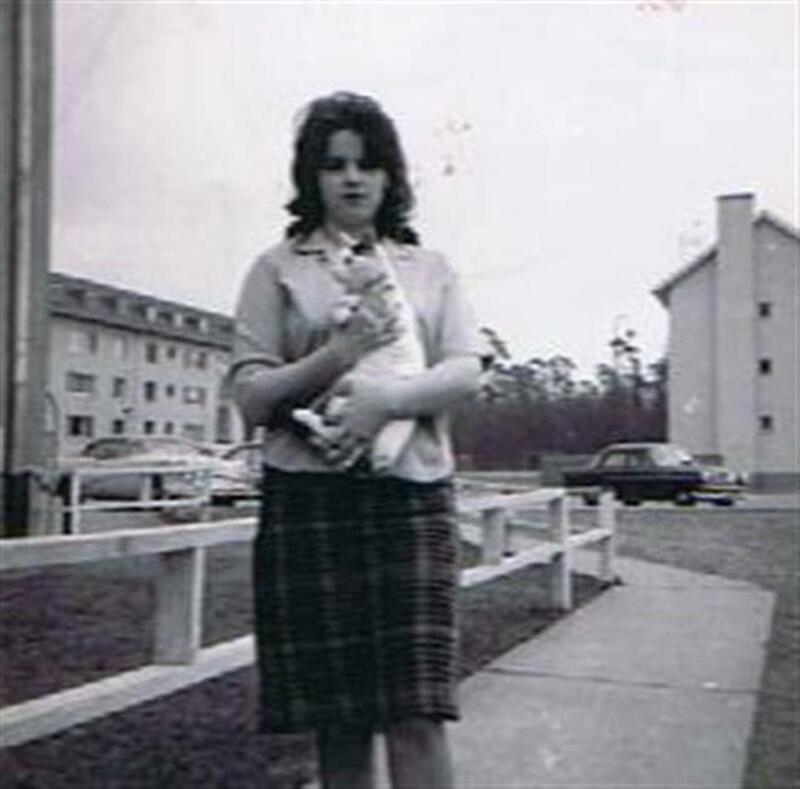 I would love to reunite with her Marianne I believe she is a teacher,and others she and I knew Maria and Angela their twins, and a roeback last name that was stationed there thru the Army at the smiley barracks. Rhonda Farmer Salas, So glad you stopped by and glad you enjoyed the hub. It's fun to look back on Karlsruhe. Just happened upon this- loved reading everyones stories! I can't remember the name of the street we lived on- but was close to the AYA- across from the baseball field. Loved those times in Karlsruhe! My brother- Randy Farmer and his wife Monika Deleary went back years ago to visit. He graduated in 75- naturally the place had changed quite a bit- but we sure have some great memories! Loved the pics! Maybe someone will come on and remember your Mom and Dad. It seems even the grown-ups had great memories of Karlsruhe. Thanks so much for stopping by and leaving a comment. This is to the post Linda Mason posted about 2 months ago. 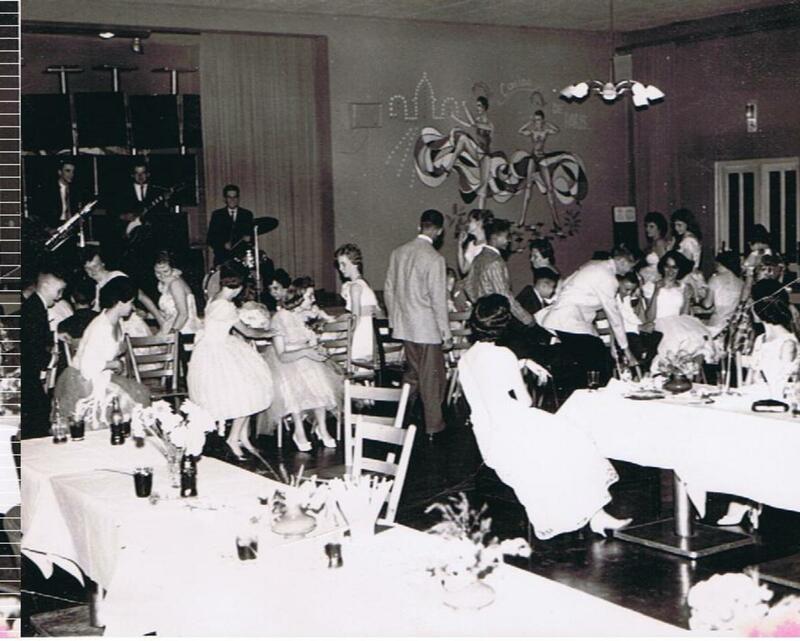 My mom and dad were @ Smiley '67-'69 and mom often talks about the great memories during that time. My parents lived at Smiley and my dad worked at Gerszewski. Anyway, my mom, Elizabeth Webster, often speaks about Charlotte [from Georgia] and Ray and their son, Raymond. She couldn't remember the last name but I'm just wondering if this is the same couple. Charlotte was recovering from throat cancer when my mom first met her. My mom said a group of them would go to church together. Some of the other names my mom remembers is: Johnny and Sue [they couldn't have children], Bea [Beth from Arkansas], Randy & Joyce. Sorry I don't know the last names. My mom lived in an apt on Tenn., 3rd Floor. pcn78, You are so right we were Americans but just completely different lives than most Americans live. I think a good life for children. Thanks so much for stopping by and leaving a comment. I appreciate it. 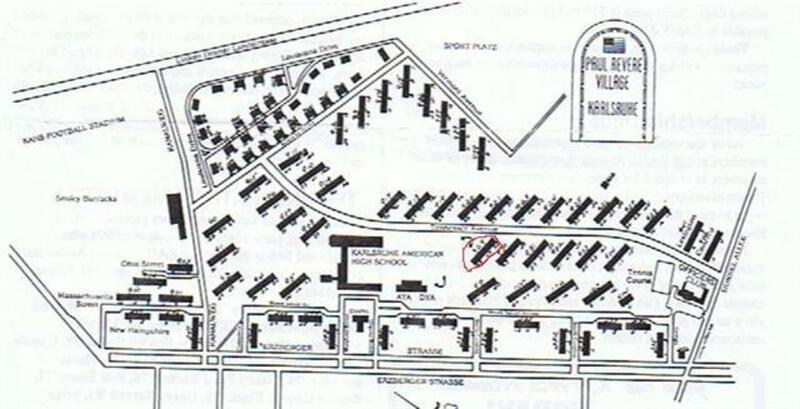 KAHS from 1974 to graduation in 1978. My father was a DOD educator from 1960 until the 1990s. 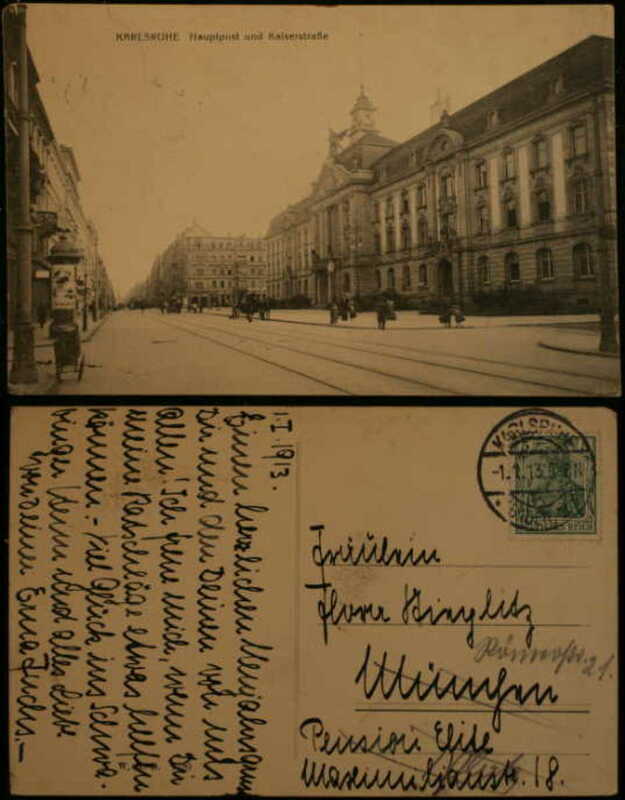 Karlsruhe was the headquarters for the dependent schools. 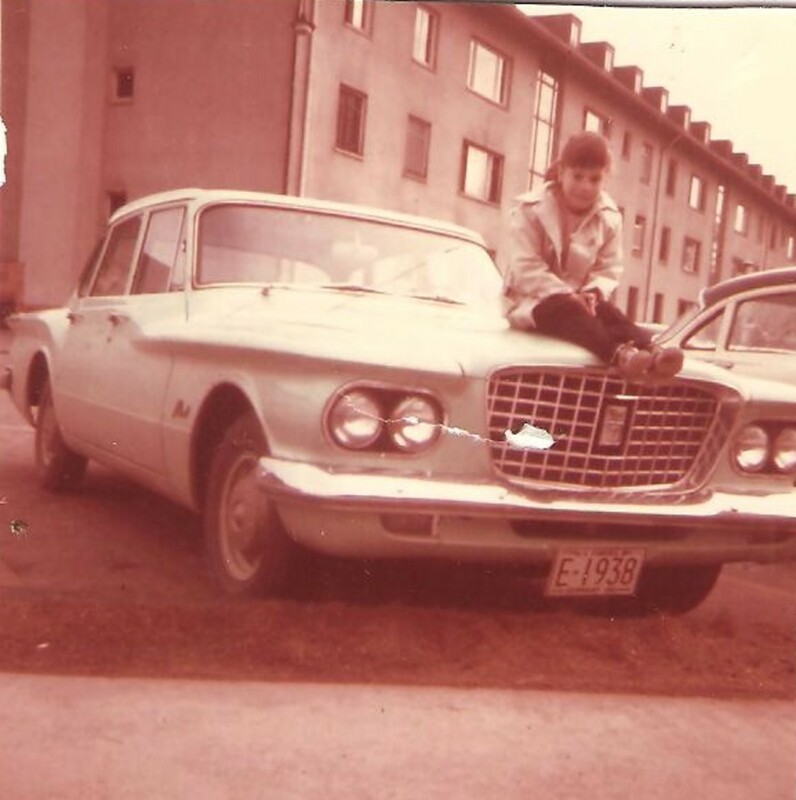 With the exception of a few years stateside, we lived in the UK, France (yes, we did have bases there) and Italy (with trips to many other places as well), from 1961 to 1978. As DOD civilians, we were there indefinitely. There was no "home" to go back to. Home was were we were and were we lived at the time. Thank you for the trip down memory lane. Bochwurst and brochen with senf, pizza (and a great side salad) at Herman's, gummis, burgers at the cafeteria above the PX, fishing at the stocked lake at Dachu when we lived in Munich, camping on the south of Italy, France and Spain in the summers, mussels in Normandy, and on and on and on. Suffice it to say that coming back for college was a bit of a culture shock. We lived as Americans, with Americans, but it was once removed and a different America than where most people lived. (Mr)Sandy Peyton, You were in Germany the same time I was there but I was older. I know what you mean leaving and going to a new state side school. The first time I went in high school in El Paso, Tx it was so large and so many kids I was in shock. 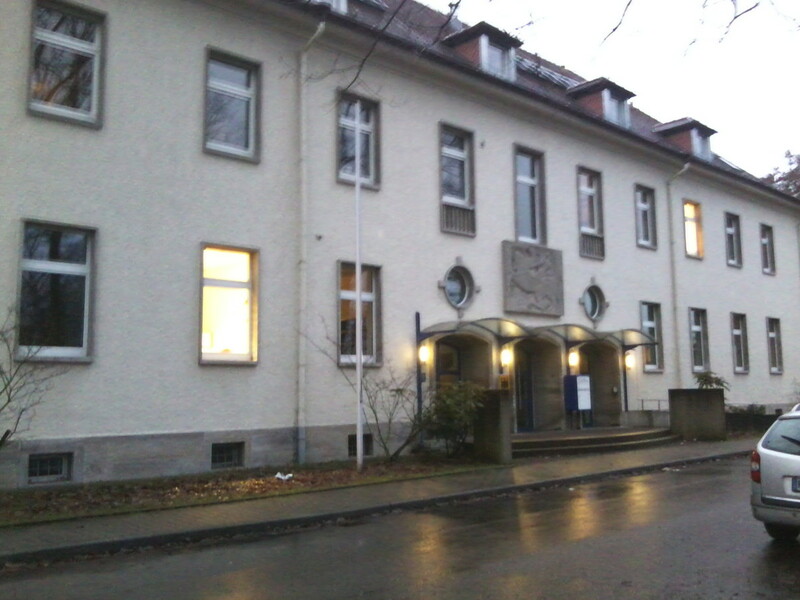 I was in a small school before we went to Germany and in Germany. Than I have go to this huge school. 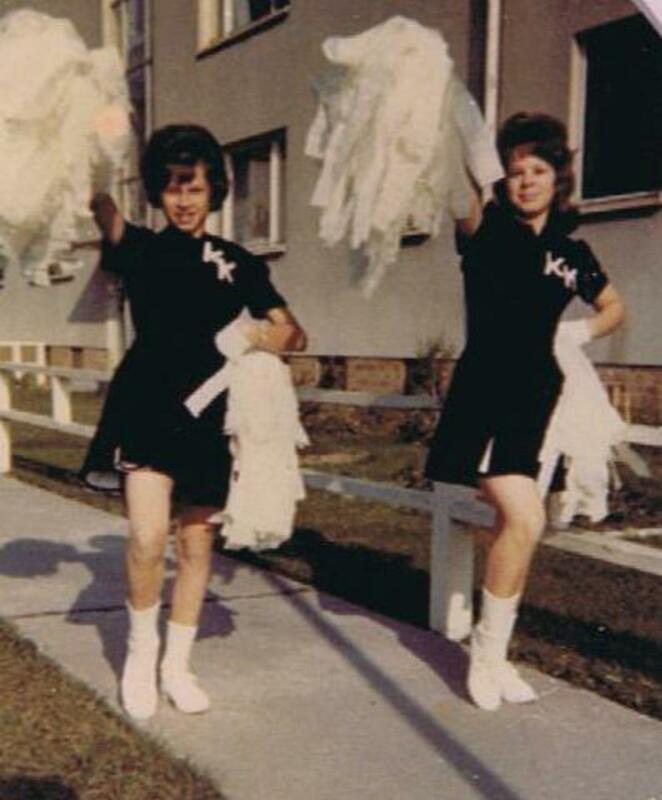 One of the girls I knew in Germany had no trouble she was a cheerleader in Germany and was already a cheerleader in El Paso. I have no idea how she settled in so fast. I know old friends are hard to find. I'm still in contact with a few. Thank you so much for stopping by and leaving a comment always appreciated. I was in Heidelberg, Germany 1959-1962. I was there for sixth, seventh and eighth grades. It was a great tour of duty and I have fond memories. The things described about Karlsruhe, in that period, remind me of Heidelberg,including the mischief we got into! Best teacher I ever had was my eighth grade science/math teacher Mr. Basham. I wouldn't trade those memories(the Wonder Years) for the world, but it broke your heart when friends moved, or you had to leave friends behind. Also, adjusting to civilian life was a challenge when you returned stateside. Making new civilian friends, and dealing with established cliques was difficult, particularly entering high school and being the "new kid." It's hard to find those old "army brat" friends, even with Facebook. Old girlfriends have married and changed their names..Sigh. You always wonder,"what happened to so-and-so. "...We're a unique community, "military brats" and we share a common bond. It seems everyone had fond memories of Karlsruhe. Thanks so much for stopping by and leaving a comment. I was stationed there from 1988-91. Live across from the Chapel on Virginia Strasse. I remember the high school well. Many fond memories of Karlsruhe. Linda Mason, Thanks for stopping by. Sorry I wouldn't know anyone from 67-69 we were gone by 62. We spent a good share of our time at the Minuteman. As long as I took my little sister with me my Mom would let me go. Maybe someone will come on and know Charlotte and Raymond Decker. My husband, Clarence Linwood Mason, was stationed in Germany from late 67 - 69. 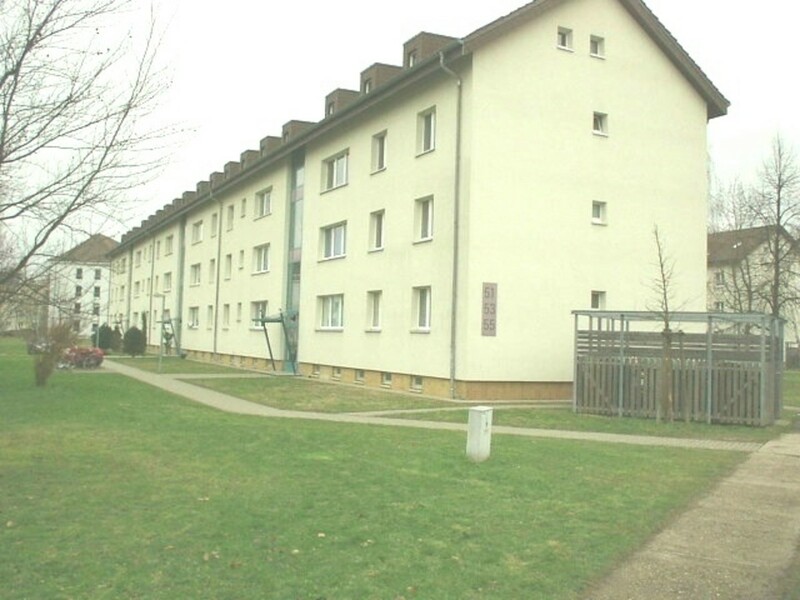 We lived off base in Linkenheim. He worked at Neureut, but we were often at Smiley to go to PX/Commissary, etc. 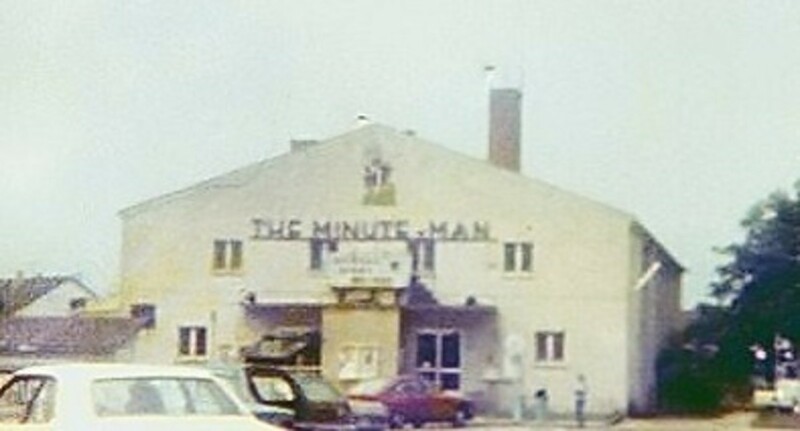 I loved going there and we went to the Minuteman just about every time the movie changed! 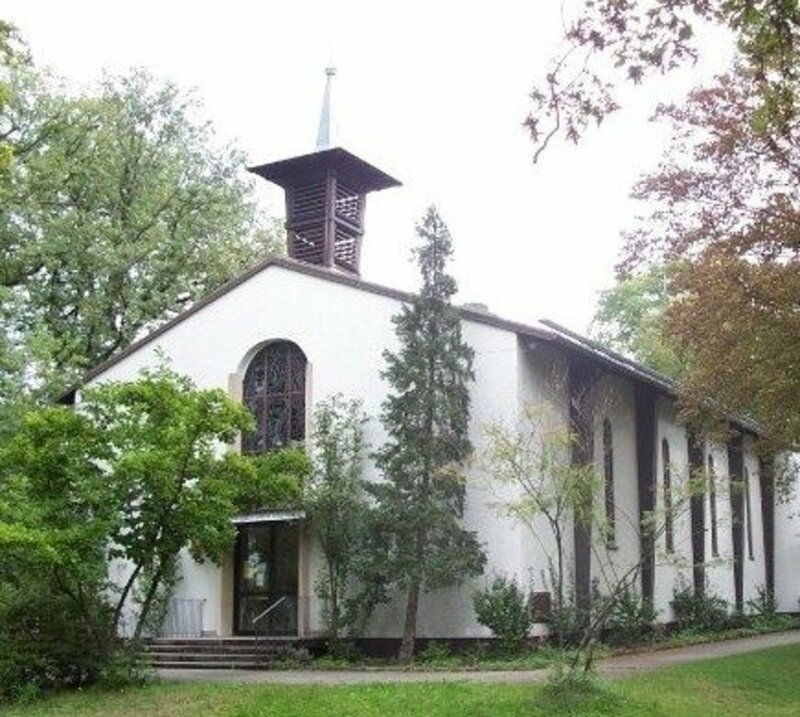 We had friends that lived at Smiley and went to church with us (we went to a baptist church in Karlsruhe - it was a German church that our church rented if I'm remembering correctly) Can't remember many of the names from Smiley - one couple was Charlotte and Raymond Decker - does anyone remember them. They had a little boy probably about 5yrs - don't remember his name. We have wonderful memories and have talked often of going back - the lady we rented from wants us to come for a visit, so we have a golden opportunity. So far haven't gotten up nerve to fly. Thanks for all the wonderful memories!!! Frederik Oly, I didn't know your grandfather but maybe someone will come on here that might have known him. Is there anyone who knows my grandfather? He’s called Mr. Isensee and was Director of Engeneering and Housing in Karlsruhe and Ettlingen for at least 20 years until he retired in 1984! Jürgen, Thank you for coming back and letting me know how you feel. 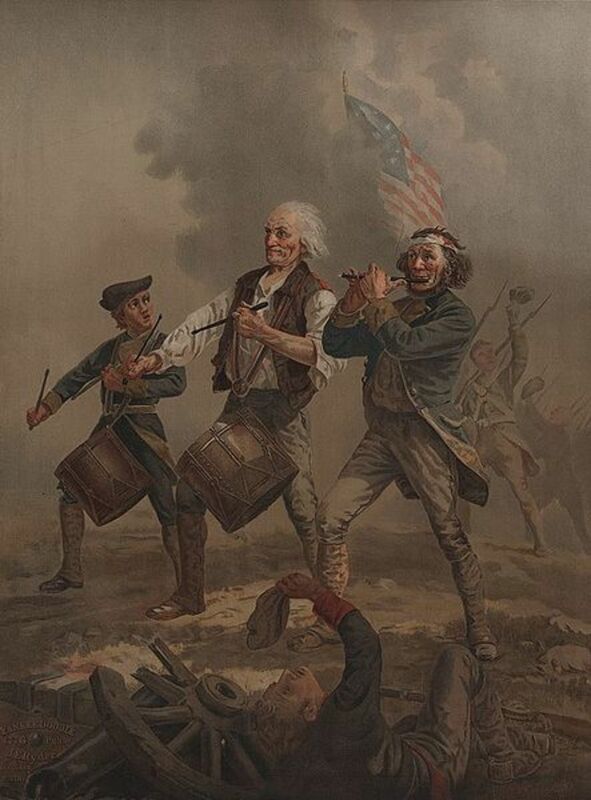 I think everyone of the military kids that lived in Paul Revere Village misses that life we had and the mix of culture.